Some of the many comments we regularly receive after each course is complete. 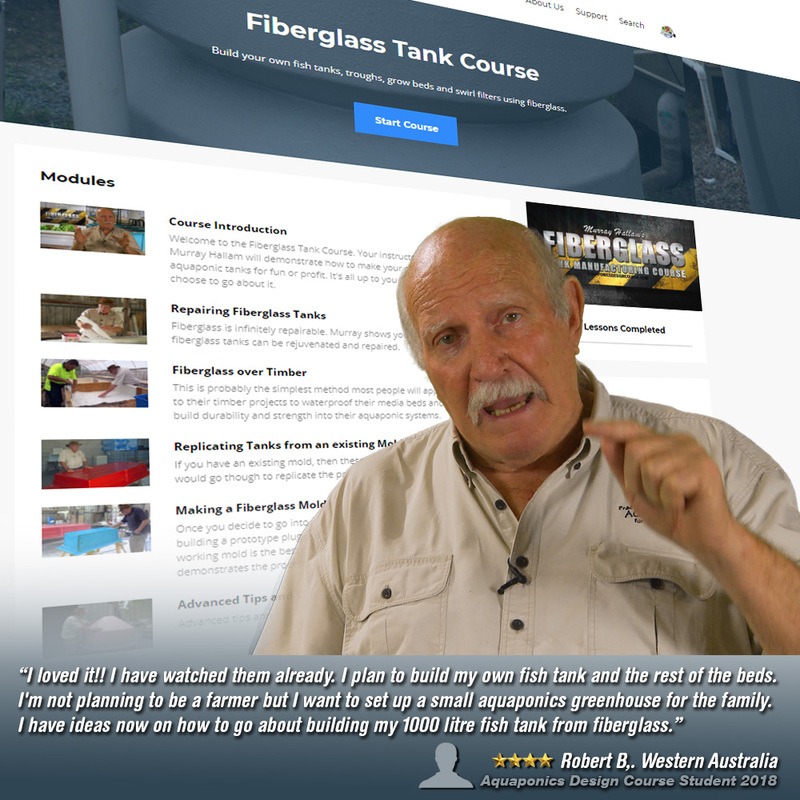 Richard M., 21 January 2019 - "Coming into the Aquaponics design course with no experience nor knowledge of aquaponics, I was very intimidated. But Mr. Murray Hallam, the instructor made me felt comfortable learning. He is very knowledgeable of the product he teaches of and made it very comfortable. I love his approach in teaching." Heiko I., Namibia, 15 January 2019 - "This course was one of the best online courses I attended. Good detailed information which will guarantee success in building small domestic systems to large commercial systems. It was a blessing to be a part of this journey and I could recommend this course to all who are interested in aquaponics. Thank you Murray for this opportunity! You and your team are doing a wonderful job." Juan Carlos B., Guatemala, 15 January 2019 - "This course was very helpful, I was able to get many of my questions answered, and given some basic lines and rules on which to stick to. The videos were very insightful and understandable. All in all an excellent course." 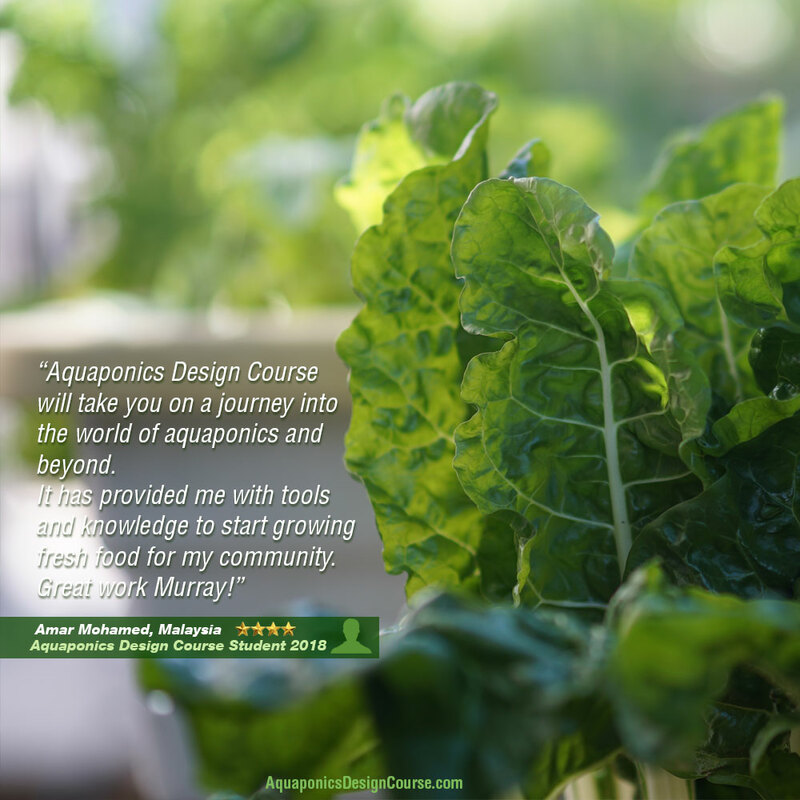 Moataz E., Saudi Arabia, 13 January 2019 - "I was looking for a guide to start an aquaponic farm and the course provided me with a road map from basics to advanced areas where I can start learning more and more to start my aquaponic project ." Shonan D., United Arab Emirates, 10 January 2019 - "The depth covered in the course, will help you plan for the scale you choose. Most importantly the examples allow you to build your models and aspirations depending on your deep rooted purpose and that i found very helpful." 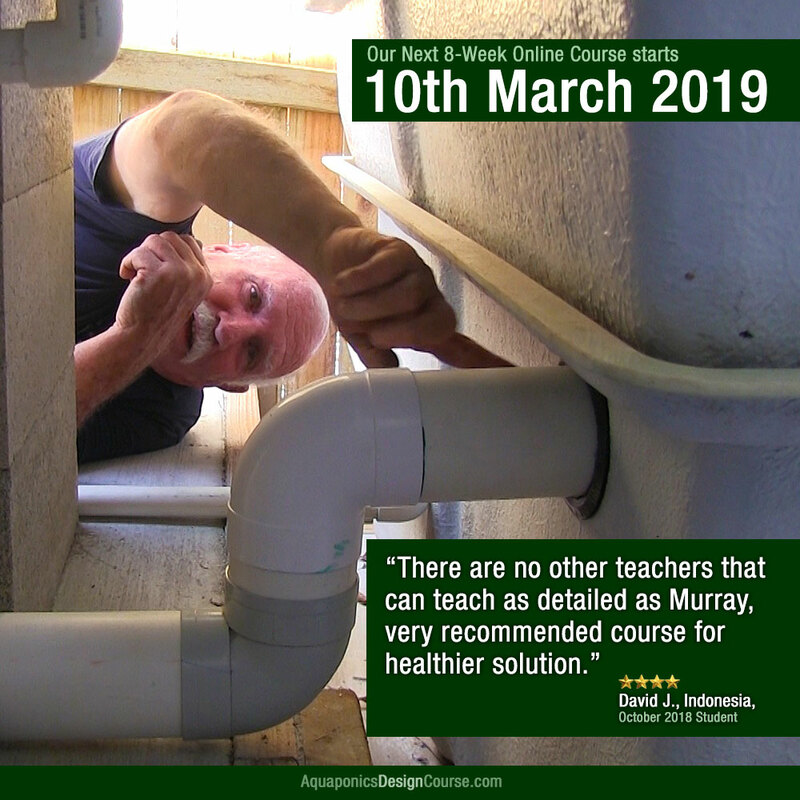 Aditya J., India, 7 January 2019 - "This is the best Aquaponics design course you can ever take. Murray is the best instructor in the world. He makes challenging topics sound so easy. Would definitely recommend this course to anyone with any interest in permaculture." Chris S., USA, 3 January 2019 - "Great course for the money! I think that anyone interested in growing their own food should look at aquaponics." Mohamed, Saudi Arabia, 30 December 2018 - "this course one of the best course i had in my live , truly life changing , will do my best now to start my own project and implement all the knowledge i learned here." Venkata R., India, 28 December 2018 - "Your classes improved my understanding about Aquaponics and now I am motivated to start my own business. Thank you." Paul F., USA, 21 December 2018 - "Thanks so much Murray for making everything so easy to understand. This course put me at least 10 years or more beyond what I could have ever learned myself. 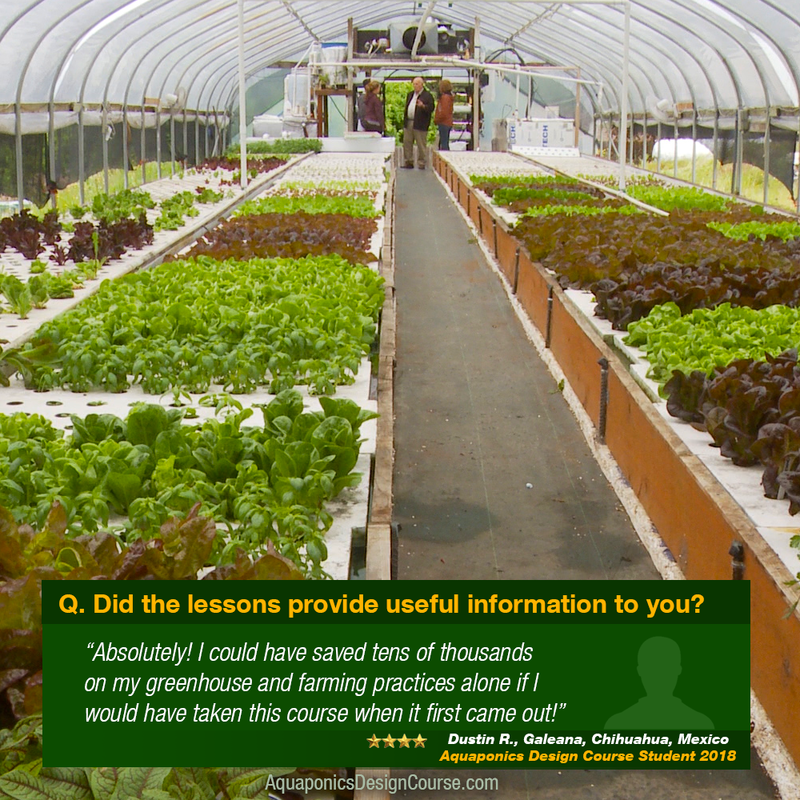 This course is a game changer even if you think you know alot about Aquaponics already. We are currently constructing our farm and hope to one day have Murray take a tour and make film here." Daniel D., Queensland, Australia, 20 December 2018 - "This is the best course I have done before and has a huge amount of information that can be easily taken in." Ronald W., Arizona, USA, 20 December 2018 - "This class was a big help with getting good detailed information about exact flow rates, stocking densities, charts, graphs, and everything else I needed to confidently design my own aquaponics system. Thanks Murray!" Muhammad, Sri Lanka, 18 December 2018 - "This is a comprehensive course that covers all aspects of aquaponics from home scale till commercial scale. The teacher Murray is one heck of an active humourous man let alone his age. His passion is visible in every video, his secret tips and advices go a very long way. This course is absolutely brilliantly done! Hard work with pure passion. An amazing course for anyone into aquaponics! Advice to future students: it is well worth the money!!!" Brendan S., Spain, 17 December 2018 (ADC) - A worthwhile journey even if you'd just like to understand the principles and possibilities of Aquaponics. This is potentially world changing and not in the same way that politicians can be. It's good for everyone. Cheers to you Murray ! Robert P., Queensland, Australia, 14 December 2018 (ADC) - For anyone who really wants to understand the fundamentals of Aquaponics and its practical application Muarry's online course is an excllent investment. 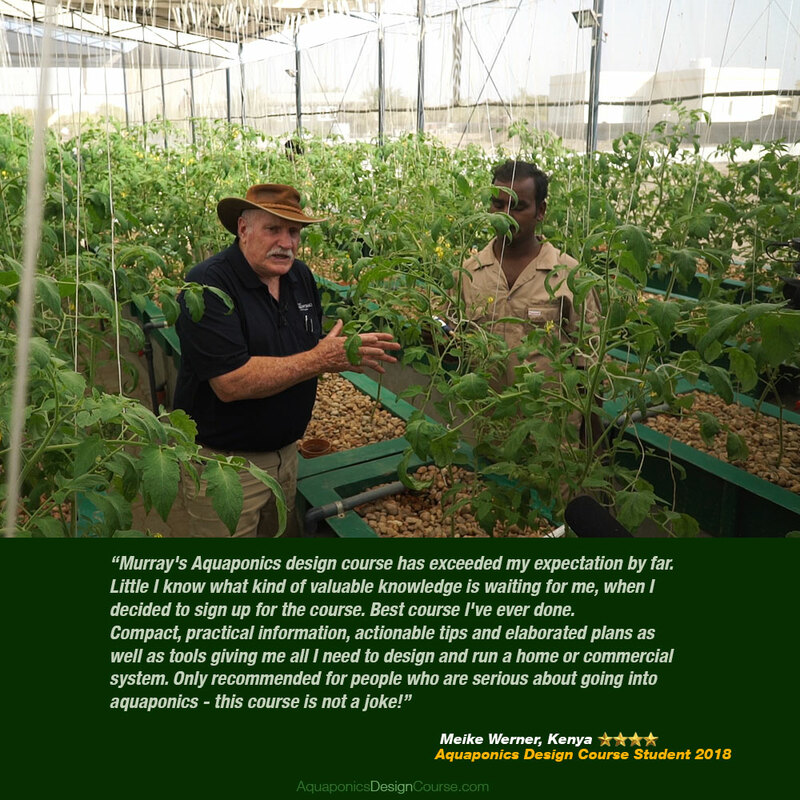 Meike W., Kenya, 14 December 2018 (ADC) - Murray's Aquaponics design course has exceeded my expectation by far. Little I know what kind of valuable knowledge is waiting for me, when I decided to sign up for the course. Best course I've ever done. Compact, practical information, actionable tips and elaborated plans as well as tools giving me all I need to design and run a home or commercial system. Only recommended for people who are serious about going into aquaponics - this course is not a joke! Jojy J., India, 13 December 2018 (ADC) - Have been having a small aquaponics farm in my balcony, and was planning to start a commercial farm from Dec 2018. Before going commercial wanted to have the technical knowledge about commercial production and this course has provided just that. A big shout out to Murray and his team for the way the course has been designed covering all aspects right from design, build , nutrients , produce and market research. Recommend this course to all aquaponics enthusiast. 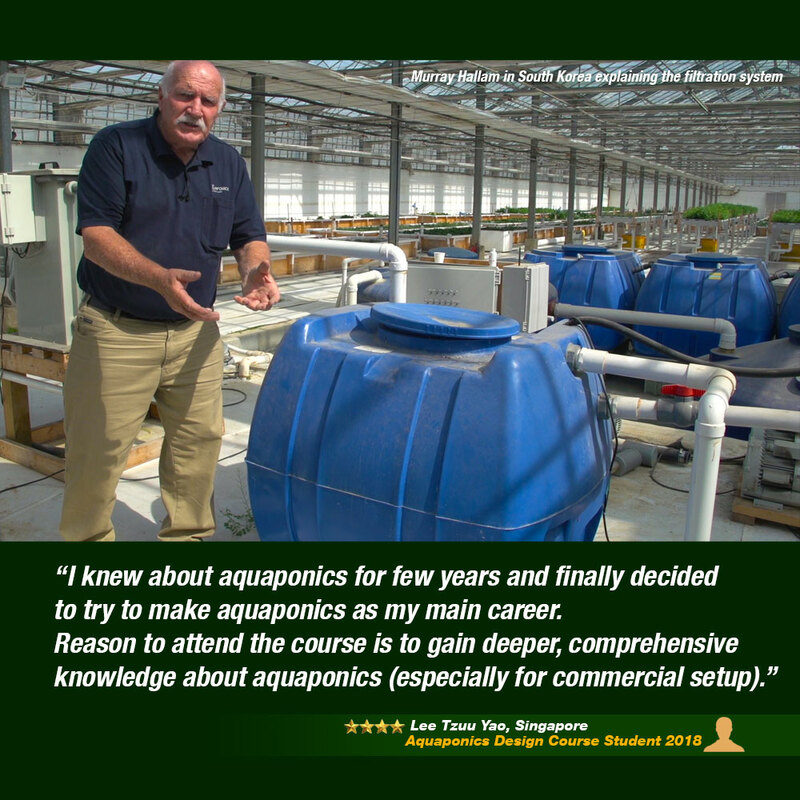 Brett G., Queensland, Australia, 12 December 2018 (ADC) - For anyone who is seriously interested in Aquaponics you could do as I did and research internet sites, blog posts,read forums and search out youtube videos, however after all this "research" I found I was no closer to understanding the parameters or how to run a successful aquaponics system than when I started. Sure I could plumb a few chopped up IBC's together and get water to flow around them, but, feed rates, stocking density, plant health etc etc etc. . . That's when I enrolled in the Aquaponics Design Course and WOW the information packed into this course has take me from a rank amateur to the point where I feel I could confidently design a commercial system if I chose to do so. Seriously I don't think there is any information left out of this course that is worth knowing. Extremely happy student. Worth every penny! Lee Y., Singapore, 12 December 2018 (ADC) - Very glad that I had participated in this aquaponic design course. Very comprehensive and generous knowledge sharing from Murray. Gain enough confidence to start either aquaponics home system or commercial system. Great value for money. Recommended to anyone that interested in Aquaponics, the pure food urban farming. Robert B., Western Australia, 11 December 2018 (ADC) - This course is very well worth the investment. No doubt. I have gained more understanding and knowledge about Aquaponics and the whole process of what it takes to design, build and run a successful farm. Murray is the grandmaster of Aquaponics to me. He is a very good teacher. His passion comes through his teaching which makes learning from him interesting and just a natural process. He's got the answers to all your questions. I highly recommend doing this course to anyone wanting to get real information. What makes it real is that you can learn from someone who has done it all and still doing it. A true experience as simple as that. 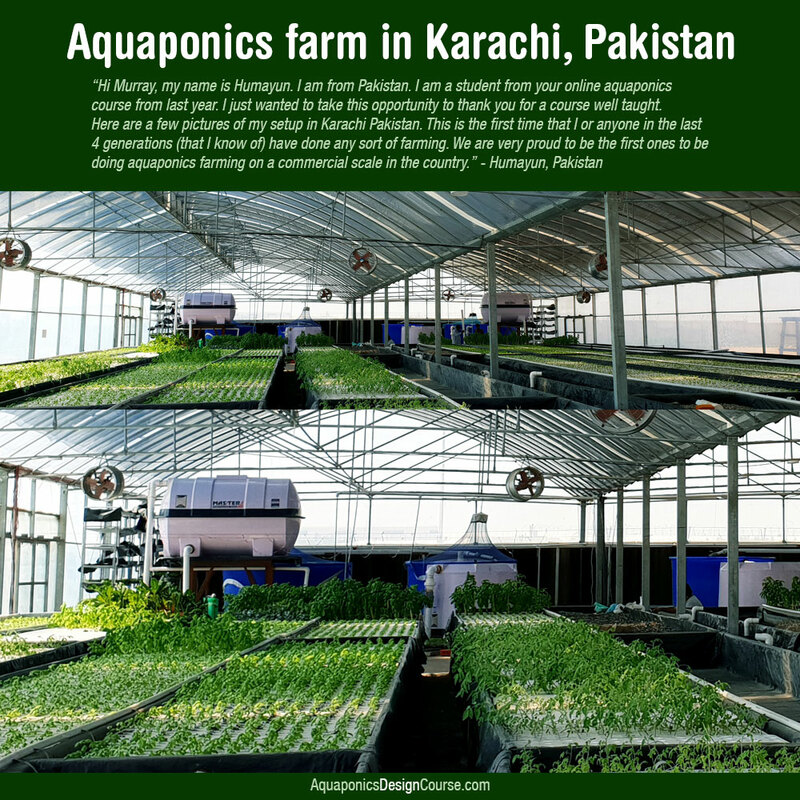 Rehan A., Pakistan, 11 December 2018 (ADC) - ADC is the best possible material anyone can have to learn about aquaponics. People on the internet portray aquaponics as some rocket science, but I have learned that its really simple if you do it the right way. I would recommend everyone interested in aquaponics to take this course before you even spend a penny on building something. Thanks a lot Murray Hallam for this learning journey ! Yousef S., Lebanon, 11 December 2018 (ADC) - Thank you Mr. Hallam for this wonderful journey! 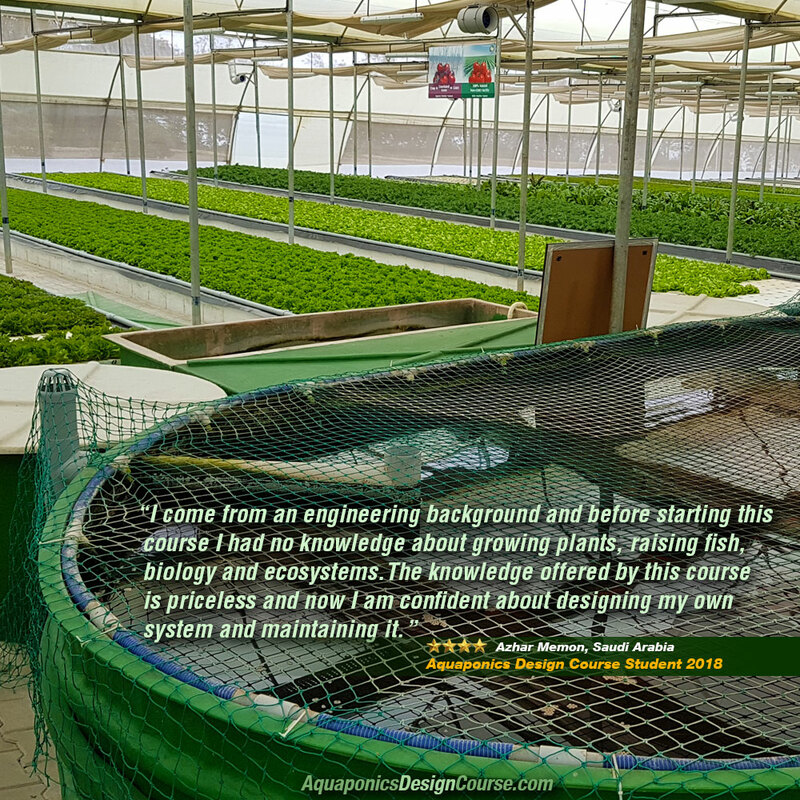 Amar M., Malaysia, 11 December 2018 (ADC) - Aquaponics Design Course will take you on a journey into the world of aquaponics and beyond.It has provided me with tools and knowledge to start growing fresh food for my community.Great work Murray! Renthia K., Namibia, 11 December 2018 (ADC) - I loved the fact that you're not boring to listen to Murray. Very interactive & responsive indeed. The knowledge you've shared has prepared me well for everything relating to aquaponics & equipped me with the most relevant & useful information to get started. Worth every penny & more. Thank you! Darrell W., Western Australia, 11 December 2018 (ADC) - Wow what a course. A great way to either just learn the basics for yourself or to learn how to expand your own system or build with confidence for friends and business. I can only but Highly Recommend the Aquaponics Design Course to anyone with an interest in Aquaponics to be taught by a master. Juan Miguel R., Honduras, 11 December 2018 (ADC) - I have learned a lot and I am anxious to start, I am 30 years old, I am an electrical engineer, I am dedicated to the automation of industrial plants in Central America, I have worked a lot in the food plant and I have always had the dream of being a producer and exporting my products. I have enough ideas to grow and get to do something big, I like the subject of biofuels and recycling, this course I liked a lot. Tapas P., California, USA, 11 December 2018 (ADC) - Thanks Murray for the helpful insight on aquaponics. It really gave me a boost to break away my monotonous career and pursue career in farming. Cheers to great learning experience. Vicken M., Quebec, Canada, 11 December 2018 (ADC) - This is a very good course that takes you from novice to where you need to be to in order to begin a successful project from design to building to managing. A very good first step to become the foundation on which to build further and adapt to any requirement. Christine R., Queensland, Australia, 10 December 2018 (ADC) - I am a senior lady and my son kindly paid for this course which I was very privileged to do. My son and I will be putting this in to practice in the coming months on his new land. Although senior (mid 60s) I found that Murray presented a very balanced teaching module, sometimes a little overwhelming with information for me, but I'm sure not for others. Not only was the vocal teaching excellent but the notes and written work was a wonderful record of what had been learnt and invaluable to keep as we move forward and try our hand at this amazing way of living. Azhar M., Saudi Arabia, 10 December 2018 (ADC) - I come from an engineering background and before starting this course I had no knowledge about growing plants, raising fish, biology and ecosystems. The knowledge offered by this course is priceless and now I am confident about designing my own system and maintain it. Derrick L., Philippines, 10 December 2018 (ADC) - The testimonials given by the earlier graduates of this course are indeed true! Don't get intimidated by the price tag of the course. Every cent of your hard earned money will be very well spent in this course. The knowledge and information you will learn is worth more than what you pay for. Rokosalie B., India, 10 December 2018 (ADC) - The entire course is comprehensive and intensive, providing many years of research information illustrated in a clear and concise manner through video, documents chats and conferences. Cameron M., Western Australia, 10 December 2018 (ADC) - Murray's course is detailed and informative. 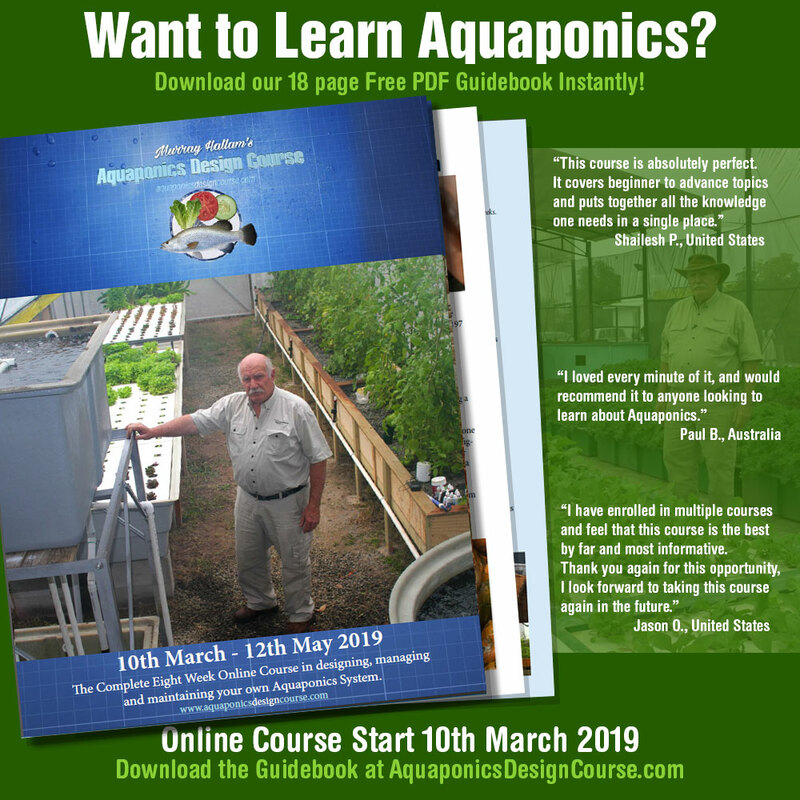 His course material is presented in a straight-forward, easy to understand fashion and presents valuable examples and insights into successful commercial aquaponics operations around the world. Murray is passionate and knowledgeable about both the commercial aspect of aquaponics and the scientific aspects that back his material. 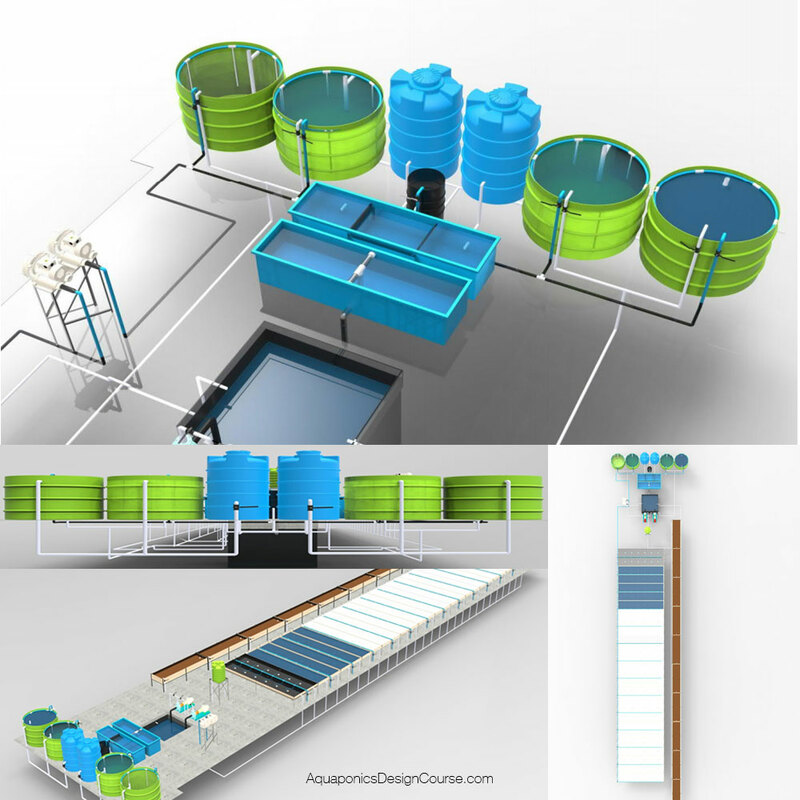 The Aquaponics Design Course is must for anybody starting out in aquaponics or those wanting to take the next step and design a money-making farm. Steve H., USA, 10 December 2018 (ADC) - Amazing course that I would highly recommend. I am very confident that I can now build a successful aquaponic system. Dustin R., Chihuahua, Mexico, 10 December 2018 (ADC) - After Building a 20,000 sq.ft. Greenhouse and successfully raising chili transplants in winter for two years now, Murray Hallam’s Aquaponics Design Course has made me realize I could have saved Tens of Thousands if not more, on my greenhouse design and heating and cooling alone, if I would have taken His course when it first came out! Thank You Murray for sharing all your knowledge with the world! You’ve started something that I belieave will change the world for the better! Michael H., New South Wales, Australia, 10 December 2018 (ADC) - I would highly recommend this course to any person how wants to grow healthy food that you can taste and smell. The commitment to excellence that Murray and his team has provided in this course is beyond that of any thing I have seen. The constant updates on new methods to improve plant health and growth is unseen in any other method. You can see and hear Murrays passion in every video and his excitement in seeing new system being developed all over the world over. Amanda J., Alberta, Canada, 10 December 2018 (ADC) - Before I had herd of aquaponics I was thinking of doing hydroponics. I visited a farm in Iceland and was kind of bummed about the monoculture. I wanted to grow a varitie and with out chemicals. I was browsing Facebook and an add for the course popped up. I thought about it for a while (months) and finally I signed up. Best decision of my life. I learned I can have it all. Chem free real organic food both varitie grown in a sustainable way heck yes. I do have some challenges ahead (limestone ) but I have the tools and know how to get me there. Raquel H., Bahamas, 10 December 2018 (ADC) - An amazing course for beginners or the advanced. I feel like I am now a part of an Aquaponics Family and I look forward to learning more with my fellow followers of Aquaponics. Thanks, Murray for being an inspiration to us all. Burkhard S., Germany, 10 December 2018 (ADC) - Although English is not my native language and I certainly did not understand everything I can only recommend this course. Alone the enthusiasm with which Murray addresses the topics jumps on everyone. Likewise the clear announcement with No goes and the economic orientation I found great. 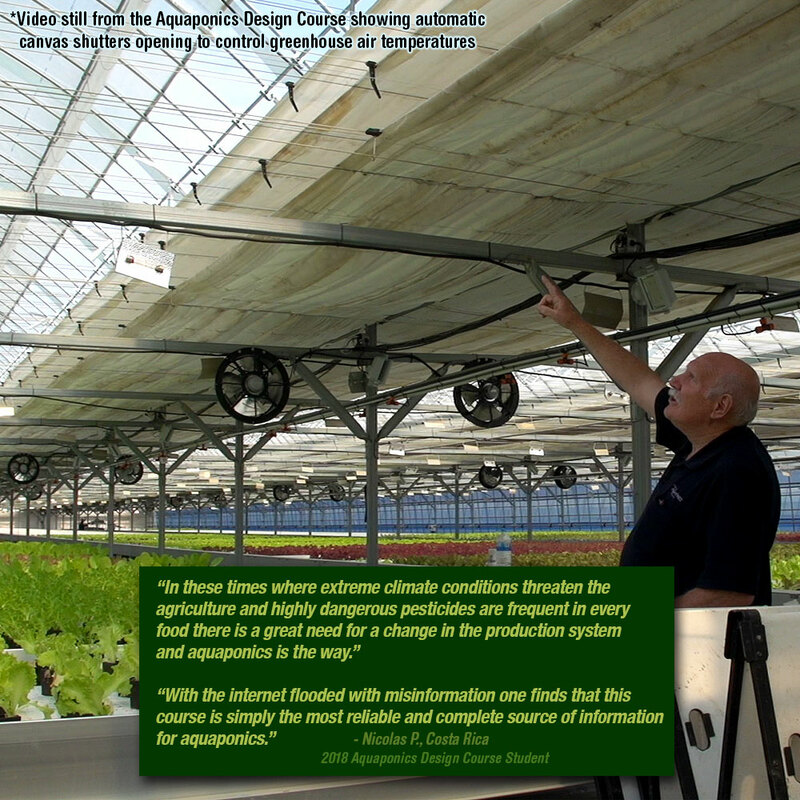 With the presentation of the real working Aquaponic farms he shows what is possible ... if you want. He is worth every euro. Ruwan R., United Arab Emirates, 10 December 2018 (ADC) - Well, I am in profession IT person and I was always thinking every day, what is my job security or once I retire from my job, what I will do for my living. In fact, I was dreaming continuously one day I essential to start my own business and that make me vigilant to start this wonderful course. I strongly believe that, this course will transformation my life very soon in near future. Murray has wonderful teaching skills and explanation always up to the mark. Indeed, the course structure explaining every single point from the beginning to advance level and 100% worth to attending such a beautiful course. I need personally thanks to Murray and he is a hidden gem. Looking forward your usual support always and this course make me absolutely confidence starting my dream commercial system near future. Tim B., Texas, USA, 10 December 2018 (ADC) - This course presented way more information than I expected. Very informative and some very detailed build instructions. The presentations are very professionally done and Murray presents it all with that "Down to Earth", warm feel that draws you in to the lessons. I have taken Many courses over the years, many of which were merely a paid for presentation to attempt to sell me to the next level of information which Might actually be useful. NOT the case with Murray Hallams Aquaponics Course! Throughout the course, Murry fills each segment Loaded with information....No BS and NO sales presentation for something else. Pure and Straight forward. Thats Refreshing. It's also a Lot to try to digest for busy people like myself. Dwight C., Missouri, USA, 10 December 2018 (ADC) - I am an engineer and I spent over two years researching Aquaponics on the internet, took several online classes and bought several videos. I discovered they much of the information out there was outdated, incomplete and outright wrong. 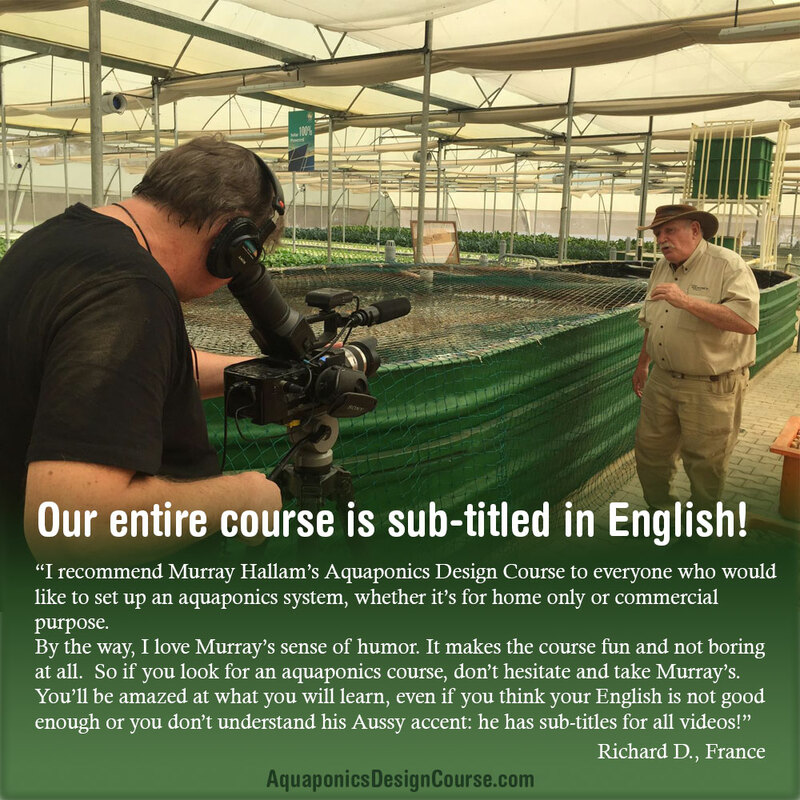 I chose to take Murray Hallam's Aquaponics Design course as it looked to be the most complete no nonsense course out there. I was not disappointed, Murray shows you that aquaponics is an eco-system in itself and how to build one that works, including the basic science and math behind it. It is a straight forward design that is totally scalable. What works for a home system will work for a large commercial system. His students have proven this by building commercial systems around the world using the same basic design. I had what I thought was a good design when I started this course and over the 8-weeks I changed it 3 times. This alone saved me untold hours of frustration and expense. I highly recommend The Aquaponics Design Course. Wilhelm D., Namibia, 10 December 2018 (ADC) - I have done 3 commercial courses now and must confess this one is by far the best. Beginner or advanced there is alot to take out of this course. The online experience is very convenient and well thought trough. Regards Wilhelm. Vishal K., Surat, India, 10 December 2018 (ADC) - The course covers everything in minute details and I now have confidence that I would able to design and run an aquaponics commercial farm. Every cent worth! Thank you for putting this course together. Nicolas B., Australia & Chile, 9 December 2018 (ADC) - A very holistic course about the conceptual and practical of aquaponics from general to specific. 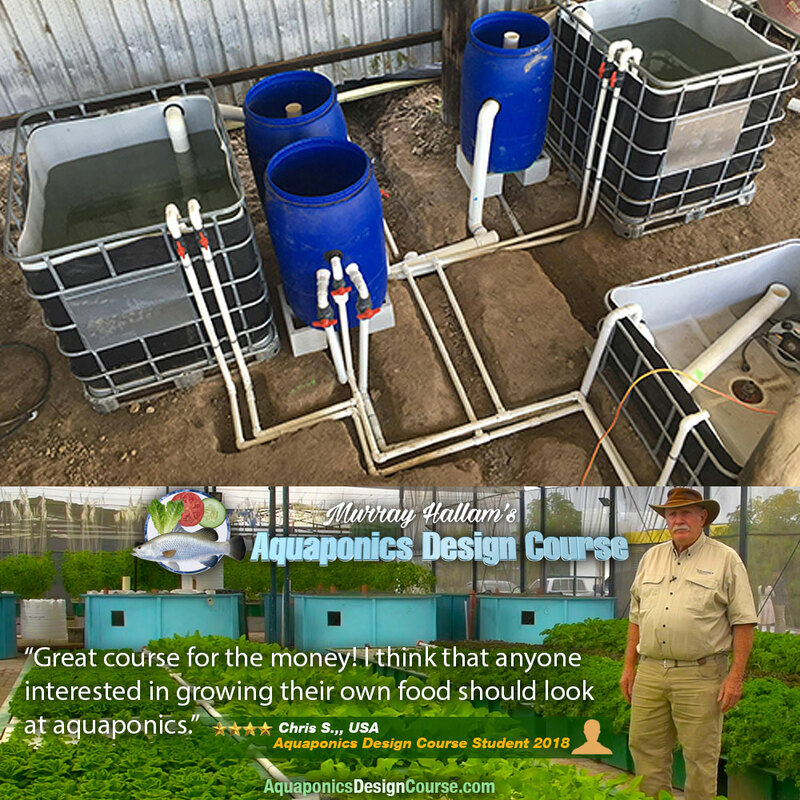 Patrick M., Queensland, Australia, 9 December 2018 (ADC) - The aquaponics design course is an absolute must for anyone interested in aquaponics, be it for a home or commercial system. Murray has such a wealth of experience that even with almost 8 years of having an aquaponics system in my backyard I learned from every single lesson. The investment is worth every single cent and I got so much more than I expected. Seung C., Republic of Korea, 9 December 2018 (ADC) - This course has provided me with more information and enjoyment than I had originally anticipated. I greatly surprised and much appreciated the immediate response from Murray and his team which demonstrated their commitment to the need of their students. Thank you! Anthony W., Philippines, 9 December 2018 (ADC) - I was already running a system for at least 8 months before I entered the course, the system was just yielding a little bit to our daily consumption and actually made our electricity bill skyrocket because of the many mistakes of making my system... during the course I learned primarily that I can lessen my pump usage and I can use 1 single pump to power the whole of my aquaponics area making me be able to provide my other pump to another aquaponics project. This course also introduced a whole lot of new concepts and diversity to the plans I can make in aquaponics... and has managed to change my perspective and would love to try it out as a secondary income generating project for my family in the coming months... currently we are now harvesting at least 1/2kg of veggies every 2-3 days in our modified aquaponic system.... thanks so much Professor Murray! Mohamed A., Egypt, 9 December 2018 (ADC) - Murray is great tutor with wealth of knowledge in the industry around the glob. I enjoyed the presentations much and believe ready and inspeired to start my first Aquaponics project. Eric F., Hong Kong, 9 December 2018 (ADC) - Brilliant and inspiring Aquaponics course from the beginning to the end. It makes me believe that aquaponics is the real future of pure food production, and this has been excellently demonstrated by Murray and his students from all over the world. Rishab S., West Bengal, India, 9 December 2018 (ADC) - At first when I was planning to enroll, I thought that a $1000 was a little steep but I'm so glad that I enrolled anyway cause the value I've gotten from Mr. Murray Hallam, his students (mostly Arvind Venkat) and ofcourse the rest of the ADC team is just, without a doubt, a ten fold return on my investment (if not more). The kind of information made available to me during course was just gold. I had no idea how aquaponics worked when I started this course and it was mentioned in the course details that everything would be covered and upon completion of the course, the student will have sufficient knowledge to start their own system and scale it as the principles remain the same. I had my doubts about that but now I can confidently say that I'm in a position to start with my very first system. It's been an amazing 8 weeks and I look forward to future courses. Thank you Mr. Murray Hallam and the ADC team. Nikko S., Utah, USA, 9 December 2018 (ADC) - If you want to understand Aquaponics in a simple way that works and understand the way mother nature lives in a ecosystem then Murray can take you there. Teh W., Malaysia, 3 October 2018 (ADC) - I get to know this course from my mentor. It was a great course as it provides all the knowledge and specification required to build a healthy and sustainable ecosystem between aquaculture and hydroponics which makes up aquaponics. Fantastics i can say!!! David J., Indonesia, 3 October 2018 (ADC) - the course is very good and detailed, Murray himself is a very good teacher, as i have been searching through web, there are no other teacher that can teach as detailed as Murray, very recommended course for healthier solution. Keep the good work !!!!!! Chloe O., South Africa, 1 October 2018 (ADC) - There is a wealth of informaton in this course, I highly reccommend anyone wanting to learn Aquaponics to sign up for this. You get to see amazing established comercial systems which open a world of opportunity to the aspiring upcoming farmer. This is farming for the future. Nicolas P., Costa Rica, 1 October 2018 (ADC) - In these times where extreme climate conditions threaten the agriculture and highly dangerous pesticides are frequent in every food there is a great need for a change in the production system, and aquaponics is the way. With the internet flooded with misinformation one finds that this course is simply the most reliable and complete source of information for aquaponics. Allan R., New South Wales, Australia, 30 September 2018 (ADC) - It has been a pleasure to take part in this course, the delivery and format that you and your team has put together is phenomenal. This has been an eye opener to the world of aquaponics that seems to have no limits to what the future may hold. 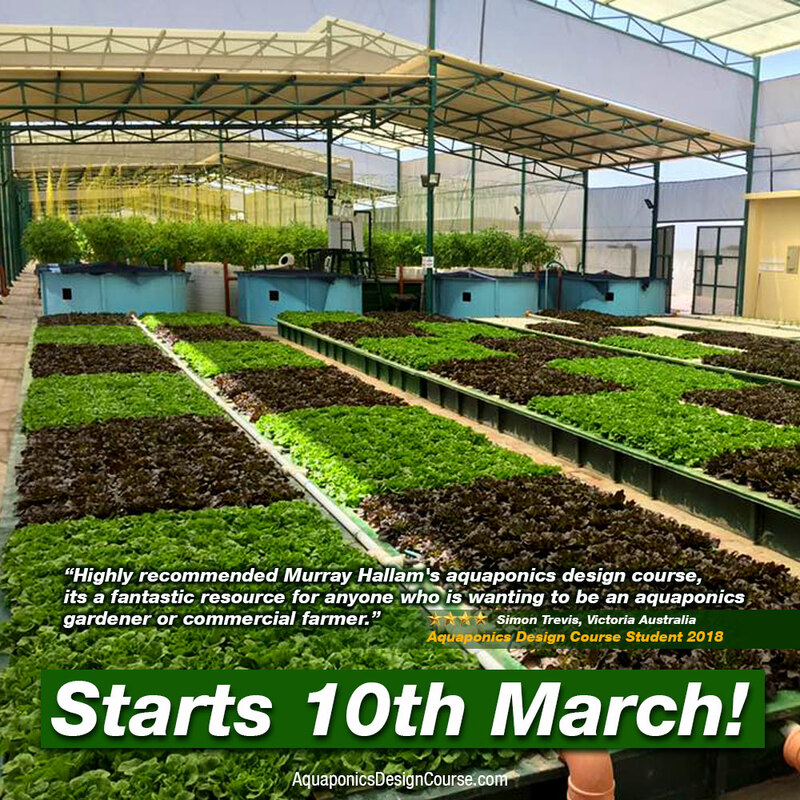 I would strongly recommend that anyone interested in aquaponics enrol in Murray’s course and learn from the best. I cant thank you enough for what I have learnt. Chong M., Malaysia, 29 September 2018 (ADC) - This course is great for anyone of any level of knowledge in aquaponics and whatever size of system one is considering to venture into. 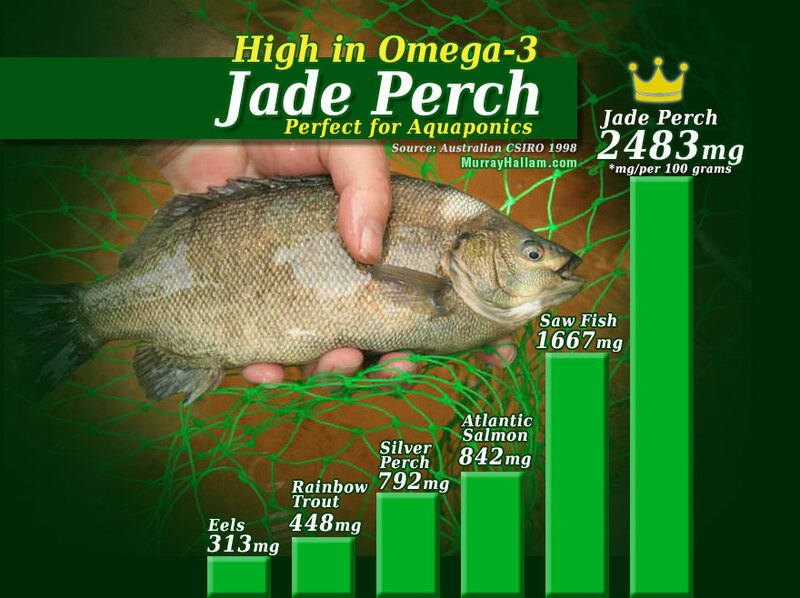 A very comprehensive information for many aspects, if not all, to run an aquaponics system properly. Abdulraheem M., Saudi Arabia, 28 September 2018 (ADC) - In this (8 weeks) course I learned about aquaponics more than what I learned from the internet in one year. I really didn't expect this amount of information and details in this course, it is an amazing course and I can say now it is a life changer course for me. Thank you Murray and the whole team for this amazing course. Marcus F., Malaysia, 15 September 2018 (ADC) - I started the course with zero knowledge about Aquaponics, never grown a vegetable and only cared for a couple of pet goldfish. At the end of the course, the information, knowledge, practical know-how and real world commercial examples and experience shared by Murray has given me enough confidence to not just build a home system to feed my family with quality, organic food that is free from harmful chemicals, but also to design and venture into commercial scale production to serve the markets. Absolutely value for money. Thank you very much! Jannie L., South Africa, 13 September 2018 (ADC) - I would recommend this course to anyone who would like to learn about aquaponics. Murray is very knowledgeable about the subject and you can see that this comes from years of experience. There is a lot of misinformation about aquaponics on the internet and this course brings it in perspective. 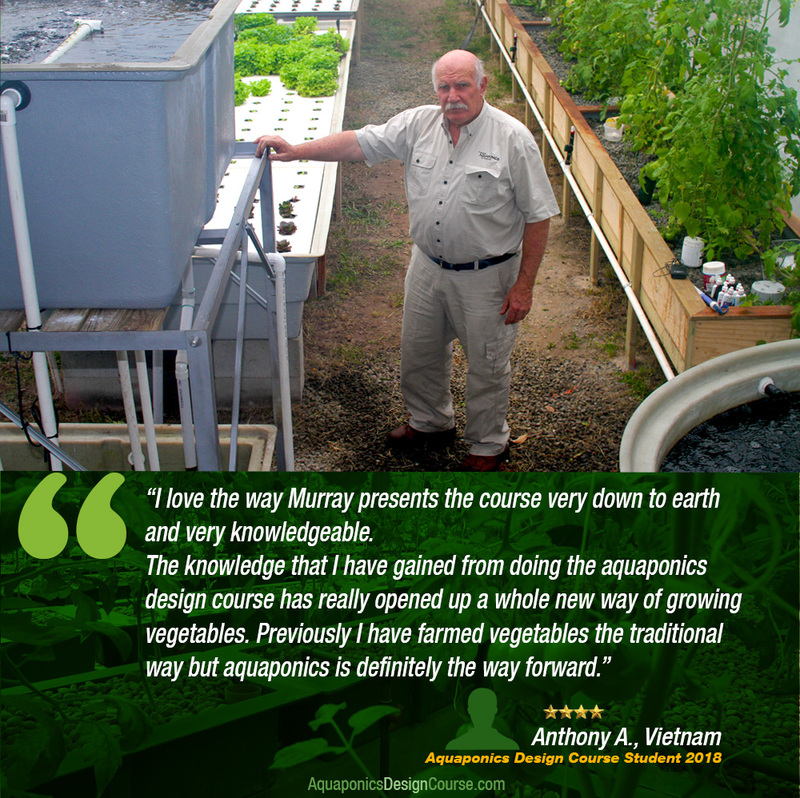 If you want to be involved in aquaponics do the course... you will not regret it. Money well spent! Bhagesh C., Kenya, 10 September 2018 (ADC) - Murray's enthusiasm and genuine belief in the power & goodness of Aquaponics could be felt throughout; one could not help but want to jump into building the system immediatelly. Tam Y., Malaysia, 9 September 2018 (ADC) - Very comprehensive course. Guided learning at every stage - lt start from Aquaponics basic principle up to full mature system covering the small scale home system up to large commercial farm. A lot of valuable information and tips gained throughout the course. This course really worth more than the money spent. This course is awesome!! Catherine N., South Carolina, USA, 5 September 2018 (ADC) - This course is a great investment and very practical. As a retired educator, I appreciated all aspects of learning offered in this course. As a student, I found I was trying to apply each week's lesson into my aquaponics building project. The weekly modules with hands-on at home really got my aquaponics project launched in a big way. This a a great way to learn and grow with aquaponics. WARNING: Aquaponics can be wonderfully addicting. I will be watching for an AA (Aquaponics Annonymous) in the near future. Thanks so much for such a fabulous course!!! Peter R., South Africa, 31 August 2018 (ADC) - I have been on several Aquaponics courses on different levels and in my opinion, this was the most informative one out of the lot. It covers everything you need to know and more and with the videos showing different farms that has actually made a success out of aquaponics, it is a good boost for a person to feel confident in taking there aquaponics career forward into the future. John B., Western Australia, 31 August 2018 (ADC) - I started the course only hoping to learn how to re-start a derelict greenhouse and grow some healthy food for my family. But I learned so much more than expected - not just how to plan and build my own system. It has been really inspiring to see how the principles of aquaponics are being used all over the world to grow food in a completely environmentally friendly way. Murray is a great teacher - very practical and full of Aussie can-do attitude and enthusiasm. Mike I., Russia, 31 August 2018 (ADC) - Murray Hallam is an example to follow. Actually Murray is not learning only to work with aquaponics but to love nature. In modern world people are losing that touch with nature. And this is very important part of aquaponics. Michael K., Hawaii, USA, 31 August 2018 (ADC) - Murray's course is top-notch all the way. I feel well informed and very satisfied with what I've learned. I don't believe there is another course out there as good as this one is! Bob C., New South Wales, Australia, 30 August 2018 (ADC) - The Aquaponics Design Course is an invaluable resource for anyone who wants to set up an aquaponics system, from small home systems to massive commercial farms. Murray Hallam has a depth of knowledge and experience that is astounding, and he has a straight-forward manner that is easy to watch. I've learnt so much from doing the course. Well worth the financial investment and the time. John S., California, USA, 30 August 2018 (ADC) - It was January 2018, I was sitting at my window enjoying my morning and had a crazy idea of trying something new, and as I gathered all my thoughts, narrowed then down to a set of parameters, the search began to find the missing piece to the puzzle. After almost three months of relentless searching and reading reviews of other students at other courses, much to my surprise almost unanimously the positive reviews led me to Murray. After signing up for the free videos, two things became very clear. First: I was very bummed that I missed the April Class, and Second: I knew with every fiber of my being that Murray and his team was where I wanted to go. I have not regretted a single minute of that decision, or the cost, which were pennies on the dollar when you consider the long term wealth of knowledge we just gained. The videos, the literature, and the downloads, along with that unmistakable Aussie Humor were priceless. Murray, I hope to meet you some day and shake your hand, and that you continue to do this as long as humanly possible. I have been richly blessed in getting to know you sir. Cheers to you and the team at Practical A/P for a job very well done. Fred D., Virginia, USA, 30 August 2018 (ADC) - Murray is very inspiring instructor, his passion and wisdom will help you to change your life. Our mission is continue his teaching so eventually we make a difference in this world. Thank you Murray for your vision! Mary D., Florida, USA, 30 August 2018 (ADC) - I enjoyed this course. It was very basic in the beginning and as the course progressed the knowledge did too. Lenel H., South Africa, 29 August 2018 (ADC) - I am really pleased with the way the course was presented and I learned a lot more than I initially expected. Starting the course with basic knowledge really helped me as a beginner in aquaponics and I would recommend Murry's aquaponics course to anyone. It was excellent and I thoroughly enjoyed it! Manarii M., Tahiti, French Polynesia, 29 August 2018 (ADC) - Excellent course...! Learned a lot of useful techniques and now it's time to apply it... Big thanks to Murray Hallam for everything. Jim D., Indonesia, 29 August 2018 (ADC) - At first I was a little hesitant to spend the money to pay for the course, even though I was quite sure that I wanted to become involved in aquaponics. I am pleased to say that after just a couple of weeks into the course, all of my reservations disappeared and now that we have almost completed the course, I can very confidently say that the course fee was an absolutely sound investment. So many of the things that I didn't previously know would certainly have caused me to waste a lot of time, effort and money. From the course materials provided I can approach my new business with the confidence that I now have a solid understanding of aquaponics, I have a detailed technical manual to guide me, and I also have a new community with whom I can discuss issues with and continue learning with as we each develop our aquaponics systems. There is a lot "free" information available on the web, and while some bits of information are helpful, much of it is either inaccurate, incomplete, or rather biased. This course which I have almost completed now gives a complete picture covering all aspects of aquaponics and linking all the various components into a complete system, and it covers all systems from small home setups to large commercial farms. There are even links and contacts to point us towards other sources of information if we have some specialist issues to deal with or want follow-up assistance. Thank you very much for sharing so much of your detailed knowledge and experience Murray. Two thumbs up!! 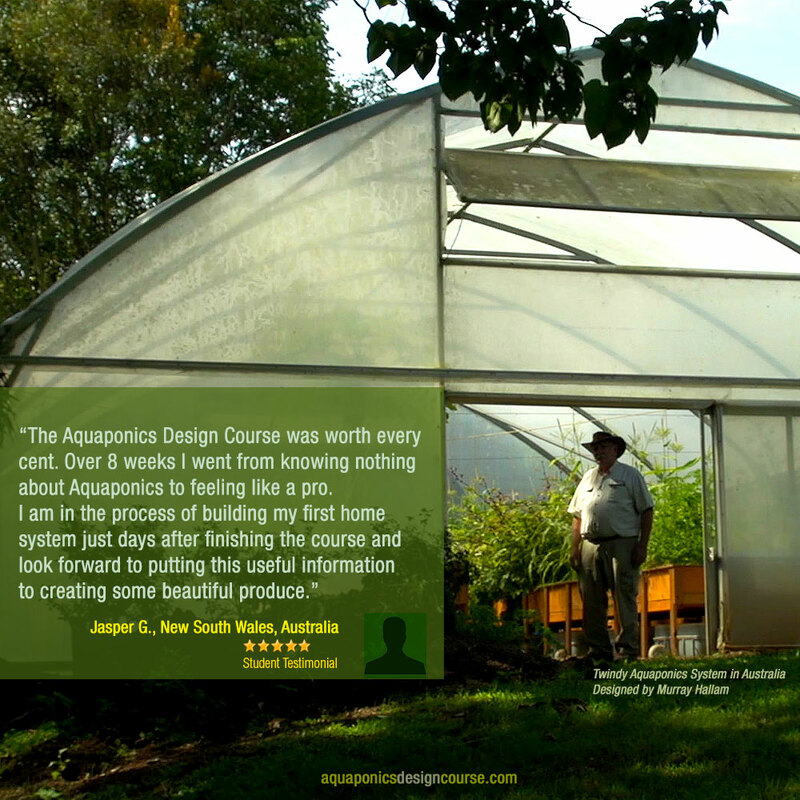 Jasper G., New South Wales, Australia, 29 August 2018 (ACD) - The Aquaponics Design Course was worth every cent. Over 8 weeks I went from knowing nothing about Aquaponics to feeling like a pro. I am in the process of building my first home system just days after finishing the course and look forward to putting this useful information to creating some beautiful produce. Aiyappa P., India, 29 August 2018 (ADC) - You and Your team are doing a wonderful job Mr. Murray Hallam. Please continue to inspire us. may you have a long and healthy life so that future generations can benefit from your knowledge and generosity. Jay B., Zambia, 6 July 2018 (ADC) - The course has been a real eye-opener. When i started to look into aquaponics, i thought i would do it just a hobby/pastime. Having seen the potential of aquaponics, and having had a tour around the farms in Oman, Korea and India, i am blown away by what is possible if one puts one's mind to it ! Amazing content, loaded with practical aquaponics knowledge and tidbits that have been gathered by years and years of experienced practitioners ! Practically every word coming from the lips of Murray and Arvind is loaded with gems on the topic of Aquaponics ! Big ups guys ! Guillaume B., France, 20 July 2018 (ADC) - I'm an agronomy engineer specialized in aquaculture… I was really excited before starting the course, and I really haven't been disappointed at all in any aspects ! It is definitely worth the money and my only regret is to not have had the opportunity to shake hands and talk with you Murray and your team ! Yes I talk about your team because I know what it is to run big projects, and I can't imagine that you are doing all this alone ! So congratulations to all of the hard working bees in the shadow behind you ! Hope we'll meet for real one day and really happy to be part of the aquaponics world ! A très bientôt et bonne continuation ! Guillaume. Lizel G., UK, 30 June 2018 (ADC) - This is for sure a world class course! The endless well of information and knowledge that was shared was just phenomenal. After completing this course I feel confident in what I've learned and feel like I will be able to apply the knowledge in a practical manner when setting up and running my own system and hopefully soon, my own business. Thank you Murray and Team! Yi-Fang L., Taiwan, 30 June 2018 (ADC) - During the course, I learned a lot and I really want to make a system for my family, maybe to a commercial system. This course is very valuable it is not just for now, that is about the future. Thank you for your teaching I really appreciate. Thank you so much! Diogo C., Portugal, 11 June 2018 (ADC) - I don't know what really say as Aquaponics speaks for it-self and Mr. Murray explains it very well. Sammy R., Delaware, USA, 4 June 2018 (ADC) - This is a very enjoyable class. There is an absolute ton of information given at a pace that is easy to do even while working full time. It is nice to be able to go back and watch videos over again if you miss or don't understand something. There is also plenty of opportunity to ask questions and get quick answers from Murray or sometimes even classmates. Leon C., USA, 1 June 2018 (ADC) - I have learned so much and have a clear plan of action thanks to Murray and this course.Would highly recommend this course to anyone serious about home or commercial aquaponics.You'll be well prepared for and ahead of the game. Angela P., Michigan, USA, 20 May 2018 (ADC) - I never realized how much “nature” was involved in the workings of the aquaponics farm. Truly amazing! This is going to make a wonderful addition to our property, by having year round fruits and veggies here in Michigan, USA. Thank you for the material and I look forward to sharing our future success ! Muhammad G., Pakistan, 18 May 2018 (ADC) - It is ones duty to provide his family a healthy pure and nutrient rich diet. At this moment there is no other known way to achieve that without adopting an aquaponic environment. Learning the concept without Mr. Murray would have been a futile exercise. I watched many videos by different people on this and made a very considered decision to take Mr. Murray as my teacher. He was very simple, straight and easy to understand and looked like a down to earth person, despite his position in this industry. Now that I have finished the course, I am so very pleased with my assessment about him and this aquaponic thing. I wish I was nearby, I would have paid him my gratitude personally. Doing a great serve to humanity. 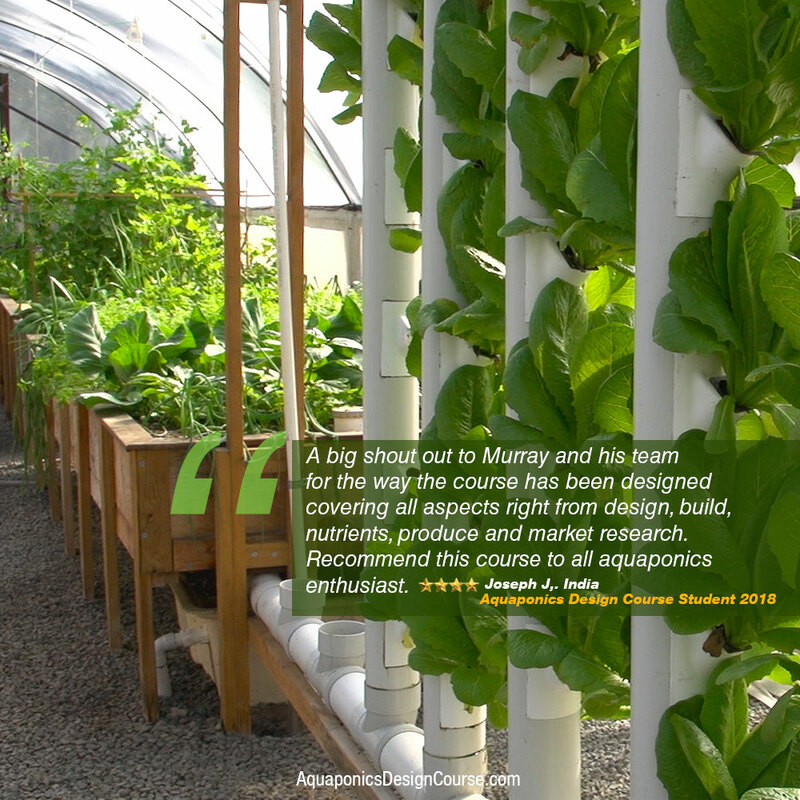 Augusto C., New York, USA, 16 May 2018 (ADC) - Murray's course is fantastic - would highly recommend it for anyone serious in learning about aquaponics - take this course and you will most certainly obtain a SOLID base and huge amounts of helpful information and tools. Thank You Murray!! Tobler R., Hungary, 16 May 2018 (ADC) - With the information on this course I feel comfortable to start my own aquaponics adventure. Pragnesh A., Kenya, 16 May 2018 (ADC) - Amazing course. Looking at the interviews of the students who have gone to further and got great achievements in the field of Aquaponics, is such an inspiration. I can and will recommend this course to anyone interested in Aquaponics for sure. Keep it up Murray and your team. Jimmy A., Oklahoma, USA, 16 May 2018 (ADC) - Murray I had emailed you before the course cause I was worried about the 1000$ cost ,if I was really going to get my moneys worth,being I live on disability. You advised me to go read the testimony’s. I did,think I read everyone. Pirooz P., USA, 16 May 2018 (ADC) - This class was so amazing it covered everything you need to know. It was a good foundation to start growing aquaponics. I am so very thankful for Murray and his team of experts that helped paint a picture of how to begin and maintain a healthy system. Thank you for your dedication and sharing your knowledge and experience with us. Saeed A., Somaliland, 15 May 2018 (ADC) - A very detailed course which covers the foundation extensively, right up to the advanced sections to learn from. This course provides a full array of content to learn from with packed detailed information in chronological order which spares the student getting confused. Overall this is by far the best course you can learn aquaponics on online. Chloe T., Western Australia, 15 May 2018 (ADC) - Thank you so much Murray for sharing all your knowledge and expertise! I really enjoyed the video format of the course and the information I gained was worth every cent. I have recommended this course to all of my friends and family and highly recommend it to anyone wanting to run their own poly-culture farm. Mark K., Victoria, Australia,14 May 2018 (ADC) – Can’t express how good the information is, relaxed learning style of Murray is very easy to learn with, breaks the processes down to easily understandable systems that can be reproduced with confidence. Nikhil K., India, 13 May 2018 (ADC) – This course is absolutely fantastic. Other than the fact it educates you in the subject, it makes you think. Anyone doing aquaponics will be lead to experiments and innovations. Mr. Murray Hallam is a great teacher and has designed this extraordinary course. What I am taking from here is going to be just not life changing for me, but for a lot of people around me. Thank you very much Mr. Hallam. 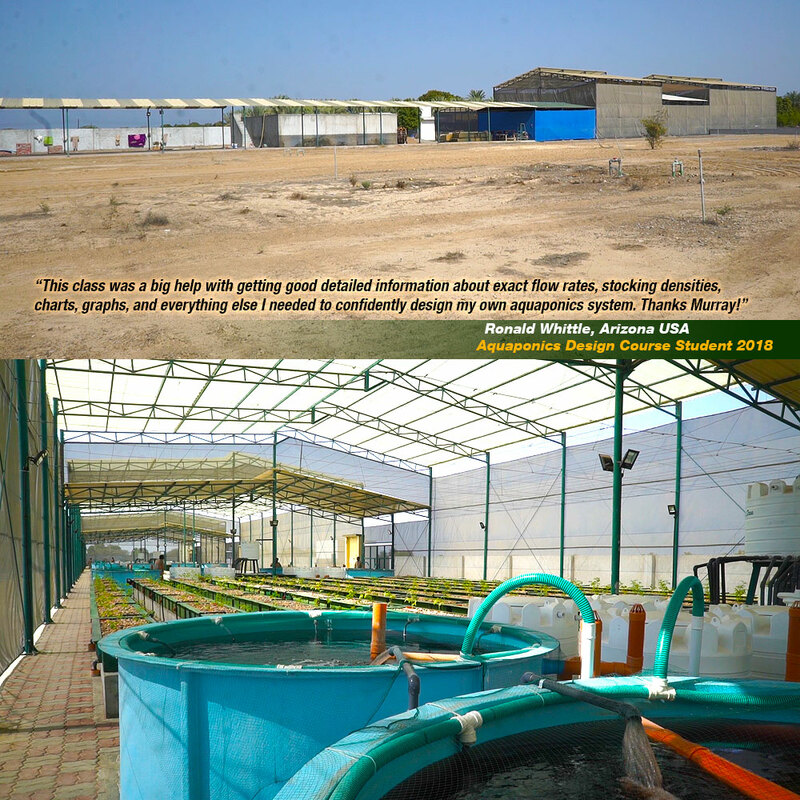 Abdelaziz A., Eastern Province, Saudi Arabia, 12 May 2018 (ADC) – The aquaponics design course provided by Mr. Murray and his team is very informative and helpful. It help me understand where I made flaws in my own setup and opened my eyes to new possibilities. Raymanda M., Mpumalanga, South Africa, 12 May 2018 (ADC) – This course is the real deal. It gives tried and tested information, so one doesn’t have to learn by trial and error. Murray doesn’t hold back. He gives all the information and wants students to be successful in their projects. This is the best value for money I’ve ever received. Thank you Murray! Chris B., Western Australia, 11 May 2018 (ADC) – I loved the course and found it to be very enjoyable and educational. This is the future for growing food and being self-sustainable if that’s your dream. Thanks, Murray for a great course. 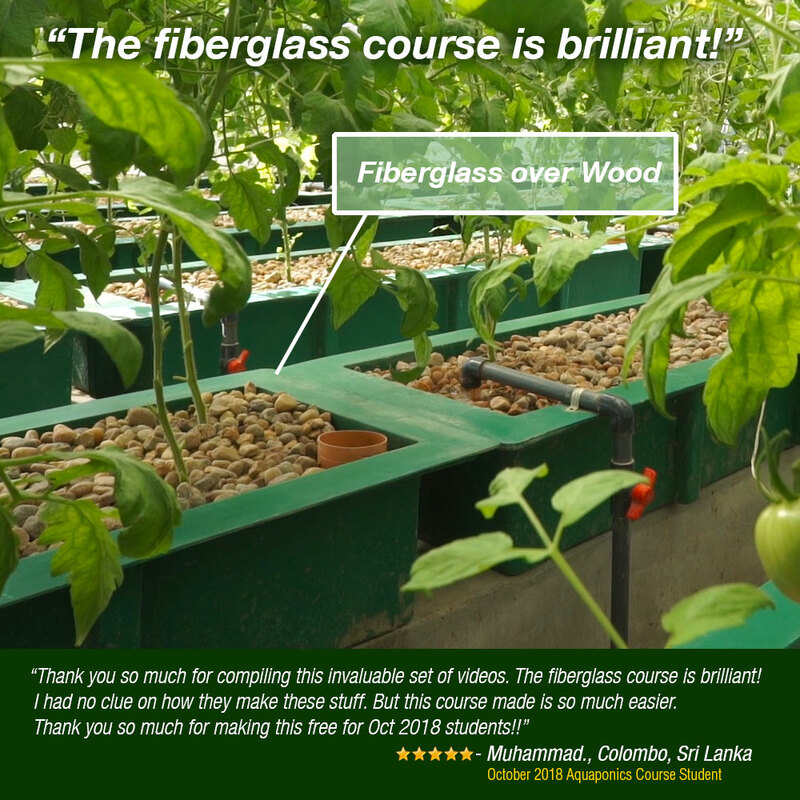 Regards C. B.
Kenzi G., India, 11 May 2018 (ADC) – This course was an incredible introduction to the endless possibilities of aquaponics. I am not only ecstatic about the prospect of growing pure food for myself and my family, but I am also confident in the fact that I can pull that off thanks to the knowledge I gained in this course. Thank you Murray! Anish T., Qatar, 11 May 2018 (ADC) – I was surprised with the density of information and knowledge that was delivered by this course. I was a bit concerned about the math behind the design and that was taken care of during the course. Regina M., Toronto, Canada, 19 Feb 2018 (ADC) – I would like to say thank you for this awesome program. The way in which you teach is easy to understand and very well done. I wanted to learn about aquaponics so that I can install a system at the boys and girls club I teach at. Well, just last week the children and I installed a small system in the classroom. We are now cycling the system! Jason O., United States, 2 Feb 2018 (ADC) –Thank you, Murray, for offering this course. I have enrolled in multiple courses and feel that this course is the best by far and most informative. thank you again for this opportunity, I look forward to taking this course again in the future. Shailesh P., United States, 1 Feb 2018 (ADC) – This course is absolutely perfect. It covers beginner to advanced topics and puts together all the knowledge one needs in a single place. Murray is a great instructor and very personable. I enjoyed it tremendously and have recommended it to my friends. Stuart D., Australia, 31 Jan 2018 (ADC) – Murray is very inspiring. Worthwhile doing. Information-packed. Richard D., France, 17 Jan 2018 (ADC) – I recommend Murray Hallam’s Aquaponics design course to everyone who would like to set up an aquaponics system, whether it’s for home only or commercial purpose. Murray has great experience in Aquaponics and shows it in his videos. He has countless systems that he started and where he makes experiments (the best would be the 4m-tall papaya tree) and you get to see them during the course. What is also important and impressive is the many interviews and visits of farmers and farms all around the world. It proves the sustainability of aquaponics and it is not just backyard experience. By the way, I love Murray’s sense of humour. It makes the course fun and not boring at all. 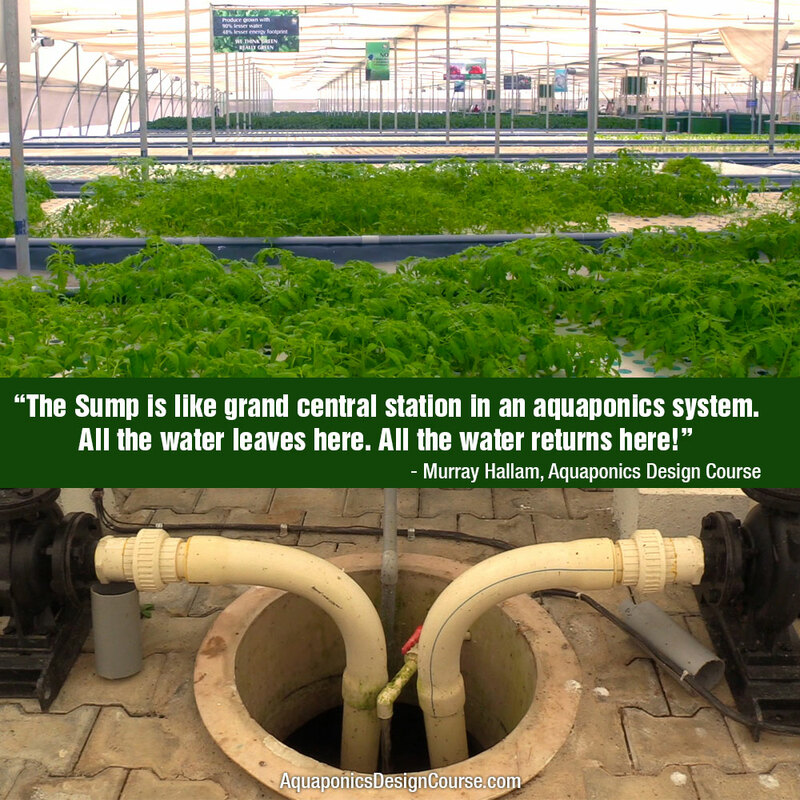 So if you look for an aquaponics course, don’t hesitate and take Murray’s. You’ll be amazed at what you will learn, even if you think your English is not good enough or you don’t understand his Aussie accent: he has sub-titles for all videos! Julie L., United Kingdom, 16 Jan 2018 (ADC) – Murray Hallam has always been the go-to guy for a practical down to earth approach and extensive knowledge about aquaponics. His straightforward teaching method is a joy and the lack of hype really appeals to me. Petre J., Germany, 15 Jan 2018 (ADC) – The Aquaponics Design System course is the best course I ever attended to in my entire life. This is the course where you really learn everything about plants and fishes working together one for each other in order to feed you and many others. Thank you Sir Murray! Maxime H., Vietnam & France, 14 Jan 2018 (ADC) – It has been a really nice journey while I learned a lot and find a way to break the daily routine with a probable farm launch, an healthier future and even maybe a new career objective! So a Big Thanks to Murray and his team for this course! 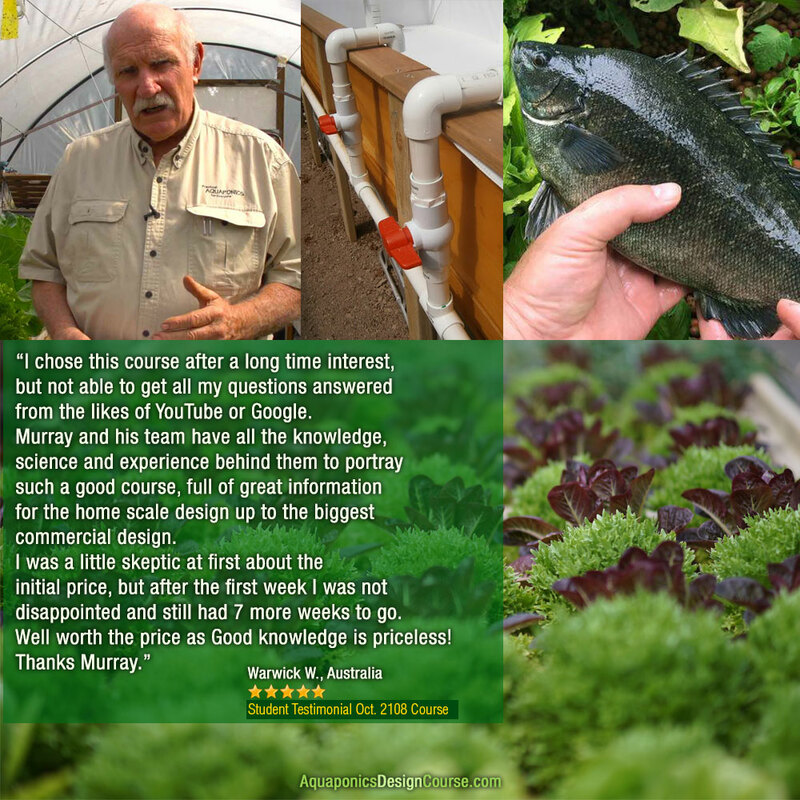 Paul B., New South Wales, Australia, 11 Jan 2018 (ADC) – A big thank you Murray to you and your team for an awesome course, I loved every minute of it, and would recommend it to anyone looking to learn about Aquaponics. I am very confident to now embark on my journey into aquaponics armed with the knowledge and expertise you have provided through this course. Thank you Murray. 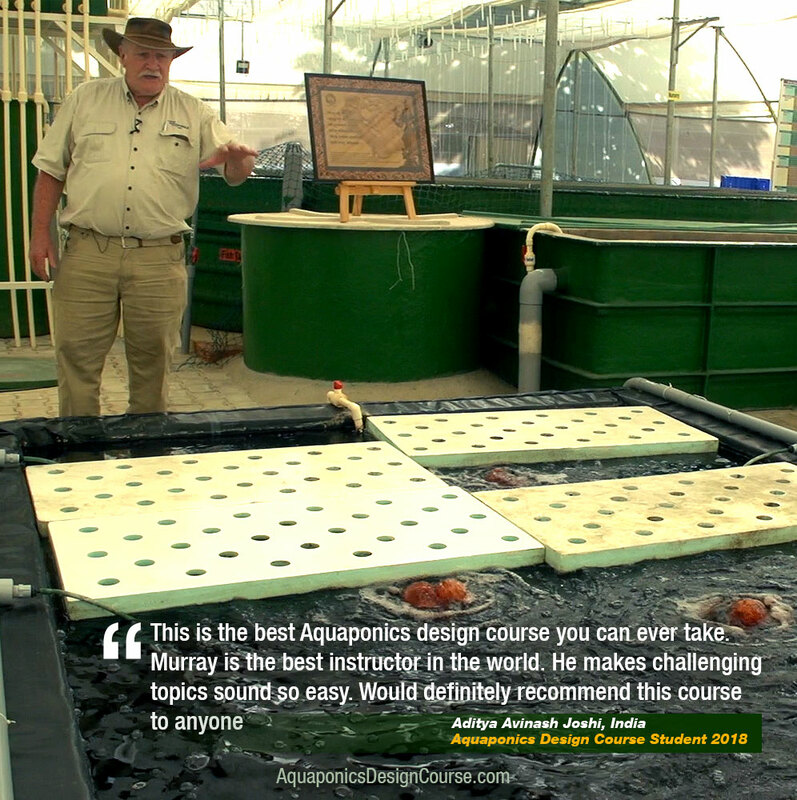 Auro S., India, 30 Dec 2017 (ADC) – I am very pleased with the Aquaponics Design Course by Murray Hallam. It provides an in-depth understanding about Aquaponics and how to build your own Aquaponics system from the comfort of your home. Murray Hallam is a wonderful teacher and is easily accessible for any doubts during the course. Another advantage is that the course provides detailed, step by step instructions, including parts required, to build a small and medium home aquaponics system. I would highly recommend this course to anyone serious about learning Aquaponics from one of the most renowned names in the Aquaponics sector. Thank you! Ryan O., Mauritius, 23 Dec 2017 (ADC) – It’s a great course, well worth the investment. The passion of Murray is great and I found the information shared is clear and well explained. Even if a business is not developed from the course, the knowledge gain can be a cost saving and more importantly lead to a health way of living for the family. Should be a subject at schools. Thank you. Ryan. 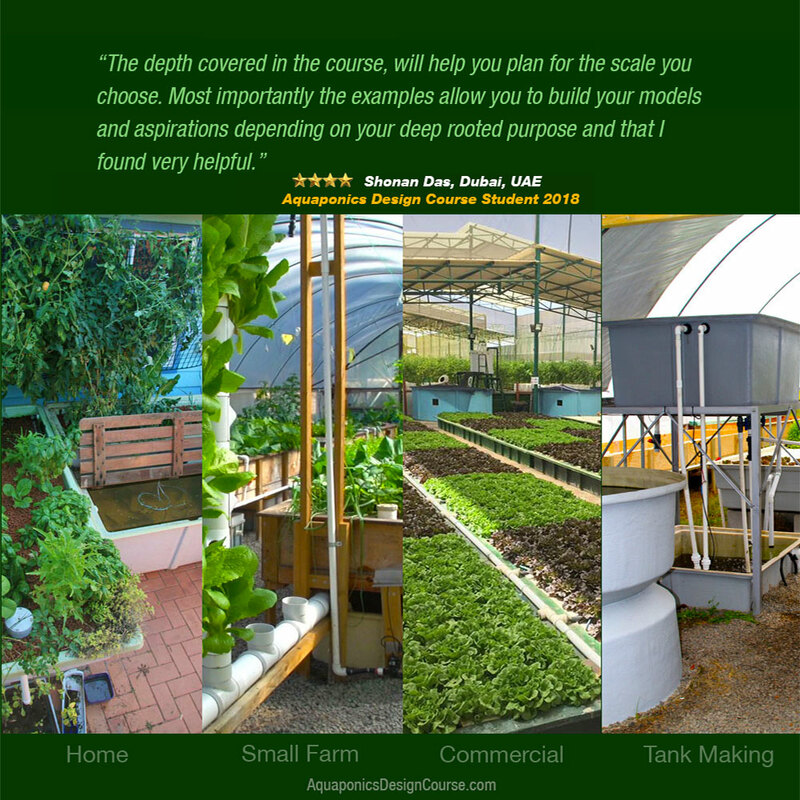 Deepak L., United Arab Emirates, 22 Dec 2017 (ADC) – Mr. Murray Hallam’s Practical Aquaponics Design course is a wonderful way to get the precise and right knowledge needed to give oneself the confidence and excitement needed to get into this wonderful new industry. I would highly recommend anyone to join. The amount in knowledge definitely bypasses the cost of the course. Murray himself is such a dynamic personality which makes the course even more enjoyable. Tracey Lee V., South Africa, 14 Dec 2017 (ADC) – I just want to say if you thinking of doing this course, do not hesitate, the wealth of information you receive is fantastic. It’s easy to follow and support is there, every week you are inspired. I would highly recommend it and it’s very good value for money! Vincenzo C., South Africa, 14 Dec 2017 (ADC) – I found this course to be incredibly informative and the things I picked up from the course material I would have never been able to find on the internet. This course for me was without a doubt worth every single penny and every second of my time. I would do the course over and over again not only because its informative but it’s also extremely fun learning with Murray Hallam. 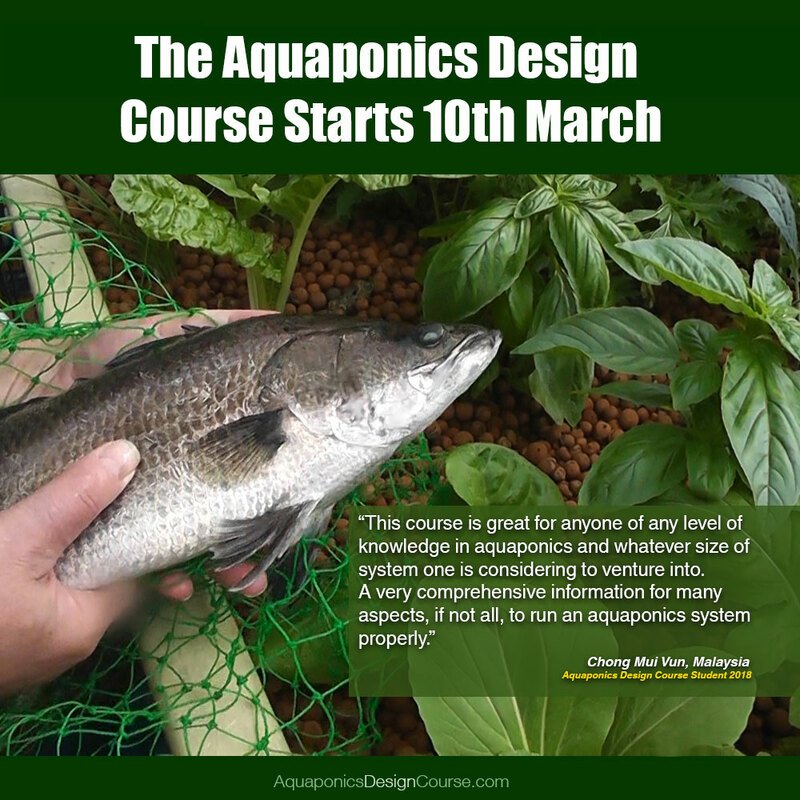 This course has without a doubt catapulted me way ahead of what any other course out there will, I know this as I have done a few other courses, and the Aquaponics Design Course is light years ahead of the rest. Don S., Missouri, USA, 8 Dec 2017 (ADC) – I’ve watched many of Murray’s videos on YouTube. They were a big part of my justification to take this course. I liked his background with building boats. It gave him a background for building the tanks and materials. He kept things simple, which is probably best method to deliver all levels of Aquaponics. His presentations were easy to understand. Carrie W., Canada, 8 Dec 2017 (ADC) – This course is so accessible. I put on my head phones, jumped on the treadmill and listened to the lessons. Perfect because I’m so busy during the day that to try to get to a regularly scheduled class would be extremely challenging. The course is well thought out and logical. Step by step for everything. So well explained. I’m so excited to get started…..although I’m going to wait until spring because winter on the west coast of Canada is a little cold to play outside for very long and very soggy. Maria B., Philippines/Canada, 7 Dec 2017 (ADC) – I love plants especially vegetables, it was my wish to work part time in a hydroponics greenhouse here in Vancouver when I came but I never got the chance to, not even seeing one. I never realized that one day I can even have the chance to build my OWN aquaponics because of this Aquaponics Design Course!! And its better than hydroponics! Plus I can even go commercial one day too! 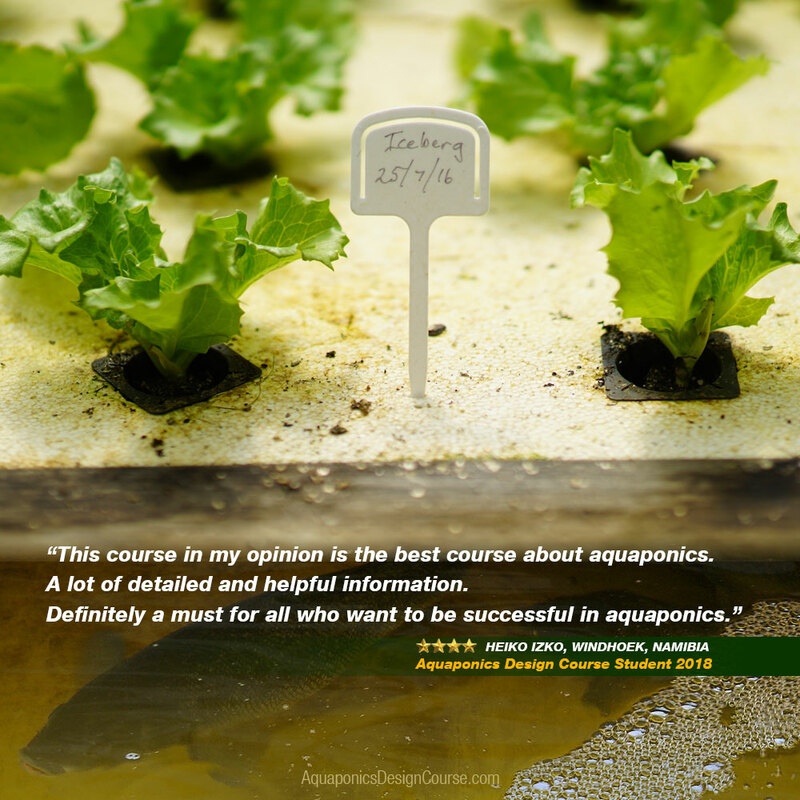 Its a COURSE BEST DESIGNED to learn AQUAPONICS! Thank you Mr. Hallam and to your team! Rejo I., Muscat, Oman, 6 Dec 2017 (ADC) – I had acquired a fair idea and basic concepts about Aquaponics from the internet and from the book Aquaponic Gardening – A Step-by-step guide to Raising Vegetables and Fish Together (By Sylvia Bernstein). However, the tables turned when I visited the Aquaponic Farm designed and built by Murray Hallam’s student Arvind Venkatesh here in Oman. My interest grew from fascination to a desire to learn in depth about growing this ecosystem. As I watched some videos from MurrayHallam.com, I came across an interview Murray had with Arvind and his projects. I was keen on learning more from Murray who is one of the pioneers in this field. The course is undoubtedly one of the best and gives valuable knowledge for anyone who wants to learn in detail about aquaponics. Lim C., Pahang, Malaysia, 5 Dec 2017 (ADC) – Murray is really a good teacher which no willing to learn, expose and experiment all sort of thing related to aquaponic by himself. At the same time, Murray is no hestitate to share update and comment on the question u face in aquaponic. Being want to be a casual or commercial AP farmer. This is a much better way to learn as compare to learn from a casual or commercial farmer as ADC able to gather information and hard data from various real-life experiment. This is a course worth to enroll in! Luana G., Barbados, 5 Dec 2017 (ADC) – This is the best online course I have ever done. From start to finish the content was precise and easy to understand. I never felt that I was left behind or in the dark about anything. Very good value for money. Excellent presentation style. Excellent videography. Each module and video was the right size and length to make it manageable and you never felt overwhelmed in any way. The questions were answered in a timely manner. The fact that you come away with not only the knowledge gained from the course, but a handbook, bonus videos, templates to log daily readings, business tools in the form of spreadsheets, a mind mapping tool, as well as access to the videos for a year, to the forum, really blew my mind! These were bonuses I never expected. This course has opened my eyes to aquaponics in a way that I have not been able to find anywhere else. The case studies really helped with the vision a student may have of going on to doing aquaponics on a commercial scale. I can’t say enough about this course. Very well done. Thank you Murray, thank you Frank and thanks to all the other team members who worked to put together such an amazing and invaluable course. It feels great to be a part of this aquaponics community. Truly humbled and blessed. Russel K., Israel, 5 Dec 2017 (ADC) – I was always interested in aquaponics and its potential in the world agricultural market. I had read many books and viewed many videos online and thought that I had the theory down, however I was lacking the technical knowledge and instruction from a Pro that connected the dots for me. Having Murray walk you from A to Z gave me the confidence to build my own system without worry. The course was fun, informative, well presented and well worth the time and money. Thanks Murray (and the team)! 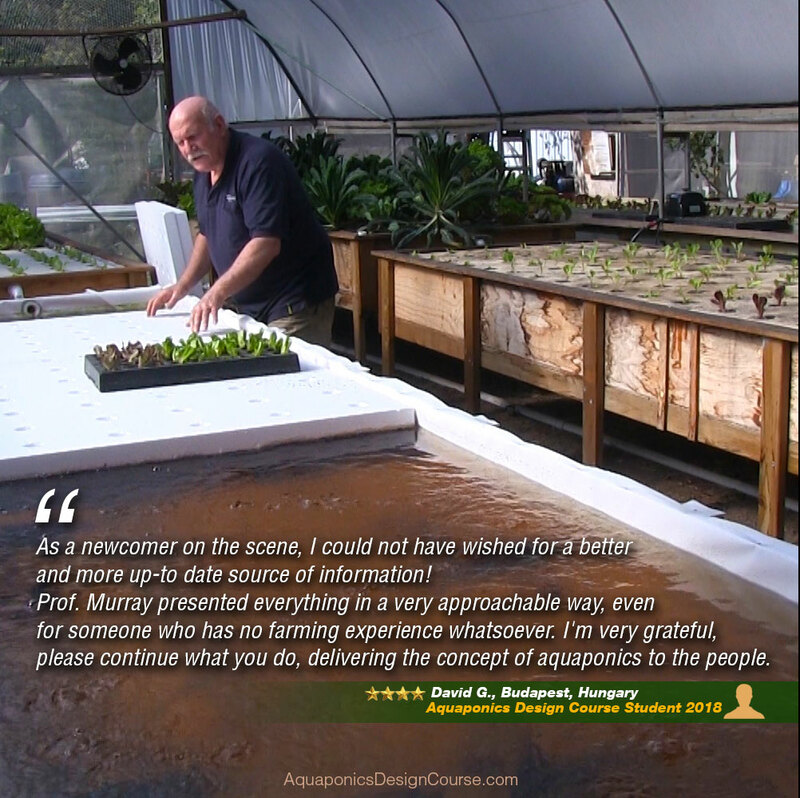 John T., California, USA, 4 Dec 2017 (ADC) – The Aquaponics Design Course offered by Murray Hallam was everything I needed to take my small amateur backyard aquaponics system to a commercial level. I would never have figured these things out without the course and Murray’s astounding presentations.Thank You! Yi Chin H., Taiwan, 4 Dec 2017 (ADC) – Really appreciate for Murray and the team. During the course, we had learned the most useful and updated knowledge about aquaponics, also had connected to so much resources. The course arrangement was so wonderful from basic to advance, and tensionless learning. I am so satisfied with your course and thanks again. Atle D., Norway/Ghana, 4 Dec 2017 (ADC) – Hi Murray. Fantastic course, your knowledge is unbelievable. I will start a commercial farm and I am sure you have saved me a lot of money and frustration. I am so happy I took the course, best spent money ever. Thanks a lot. Atle Madhava M., India, 4 Dec 2017 (ADC) – This course is very useful in understanding how aquaponics system works and pros & cons in aquaponics. The explanation by Murray is very excellent. Henry J., Indonesia, 4 Dec 2017 (ADC) – This course is very good for me as it points out many items that it would take a long time for me to figure out. 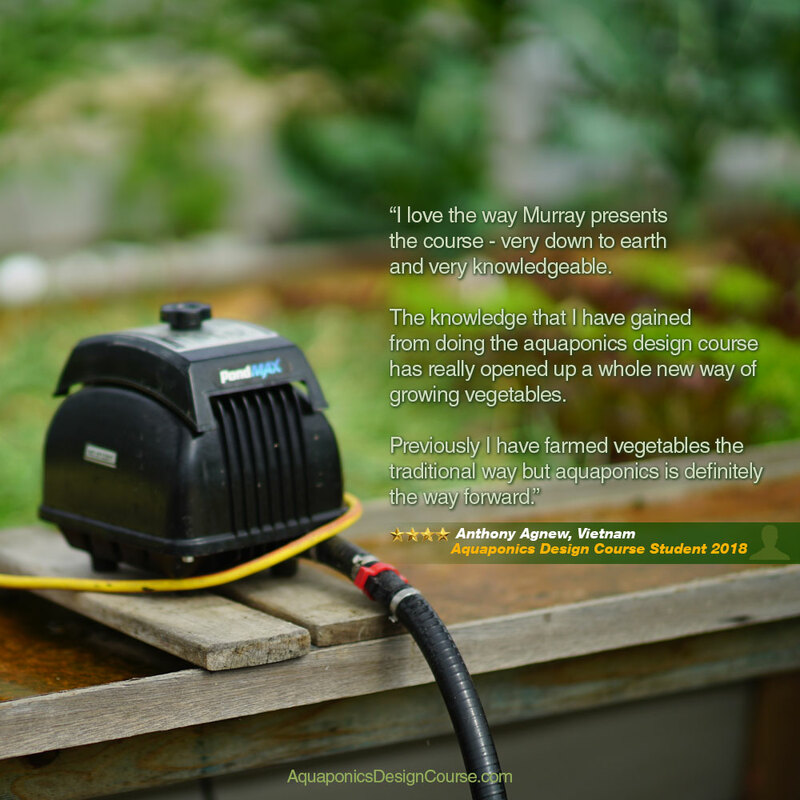 Alandre V., New South Wales Australia, 4 Dec 2017 (ADC) – The Aquaponics Design Course offered by Murray was absolutely fantastic. It is packed full of all the knowledge you need to understand the basics of aquaponics as well as lots of practical information and real life examples. I absolutely loved the course and am ready to embark on my own aquaponics journey, thank you Murray. Omar T., Abu Dhabi, United Arab Emirates, 12 Oct 2017 (ADC) – Hi Murray; I would like to thank you for sharing your knowledge to me. It was a great course! I enjoyed every bit of it. It was worth more than I have paid for. May God bless you, your family, and your efforts in putting all these great learning together. I hope to meet you personally at Oregon this November. Thanks again. Paul V., Western Australia, 6 Oct 2017 (ADC) – Thanks Murray for a well structured and presented course. All of the content is relevant and has given me a greater understanding of how my system works, if only I had done the course before I built my own system, it would have saved me a lot of time and money, it has been worth every cent. Theresa C., California, USA, 5 Oct 2017 (ADC) – Murray gives lots of great information, I would highly recommend this course to anyone that asks where to find good info. Ismael S., Philippines, 2 Oct 2017 (ADC) – Excellent work to your team Murray. I really recommend your course to everyone interested in agriculture particularly in growing plants and vegetables. So much information to gain. Christopher A., Utah, USA, 2 Oct 2017 (ADC) – I started this course barely knowing anything about aquaponics. I slowly built a system as the course went on out of ibc tanks. I now have a cycled system and have already harvested some beans, mesculin, spinach, and soon to be cucumbers and lettuce varieties. I also have a lemon tree, tomatoes, peppers, lettuces, basil, melons, strawberries, and papayas growing. I also have connections that can help me acquire the equipment to go completely solar and expand my marketing scheme. Those connections never would have come about if I wouldn’t have taken this course. I now have plans to start up an aquaponics and microgreens farm. I have many of the supplies already but am just saving up for some nice property and greenhouses. None of this would have been possible without Murray’s generosity and amazing training. This course was life changing. It is a combination of my favorite things. Fish, food, and gardening. What more can you ask for? Thanks Murray! Kristian S., Macau (SAR China), 2 Oct 2017 (ADC) – Murray’s Aquaponics course is second to none. It is fantastic in every way and I would strongly recommend it to anybody who is looking to step into the world of Aquaponics, whether it be for small home projects or large scale commercial farms. The time and commitment he has put into this course really shows, he makes hard, complicated topics easy to digest and understand whilst providing you with massive amounts of valuable, Useable information, taken from his many years of experience and the experience of his past students who have graduated the course. Truly a life changing course for me, Aquaponics is the calling I have been waiting for. I predict Great things on the horizon. Do the course, you will not regret it. Sunil J., India, 2 Oct 2017 (ADC) – This course is really good to lean aquaponics in a practical sides, because many You Tubes videos are not teaching correct methods. Mr. Murray is well experienced in Aquaponics teaching techniques and videos are very useful and teaching methods are also helpful. Mofoluwaso A., Alberta, Canada, 1 Oct 2017 (ADC) – Awesome course. So real, so practical very inspiring. Terence K., Singapore, 1 Oct 2017 (ADC) – I would like to thank Murray for providing such a great course for new entrant like me. Before my journey with Aquaponics Design Course, I thought the course would be quite theoretical. However, it turns out to be a practical and informative course. For almost 6 months, I am still learning by doing and creating my own farm systems. I’m humbled to share that the course not only help me in designing our farm system, it gives me a better perspective in life and the importance to combat food security in our country. Thank you once again! Toni M., Queensland, Australia, 30 Sept 2017 (ADC) – Very enjoyable and educational course. Murray has extensive knowledge and experience in the practice of aquaponics. Armando L., Alabama, USA, 30 Sept 2017 (ADC) – It is really satisfying to have been immersed in so much information during these weeks and to have had the opportunity to learn the wonders that aquaponics has. Oana D., Indonesia, 29 Sept 2017 (ADC) – I am in fact delighted to write this part: It took me few months to decide to enrol to your class Murray, and oh boy what a good decision that was. When I enrolled I had the feeling that there is a bit more that I need to know about aquaponics, but know what? you proved me wrong!!! because you teach me much more and opened my eyes to new ideas and opportunities. I am fairly confident of my investment now and I know I will make good use of it. Thank you for taking the decision to share the good work with us!! Evan T., South Australia, 28 Sept 2017 (ADC) – Murray Hallam’s “Aquaponics Design Course” is a great course that will cater for all knowledge levels, from the beginner to a commercial operator. The course provides a huge amount of information in a practical and easy to understand manner. Murray’s wealth of knowledge and passion for this subject is infectious and makes the learning experience all the more enjoyable. Timon S., Cambodia, 28 Sept 2017 (ADC) – A complete course packed with experience, knowledge and entertainment. Everything is very professional. Perfect for beginners. We loved it. Linda M., Italy, 28 Sept 2017 (ADC) – I feel I’ve just begun a new journey of learning. Murray is an excellent teacher, never obvious and boring. I couldn’t wait to watch the next video and to learn more and more about this fantastic ecosystem. He made me discover a whole new (powerful) world! Donna H., Texas, USA, 28 Sept 2017 (ADC) – This course is a must for anyone who is interested in conserving water, eliminating the back-breaking work associated with traditional gardening, and maximizing harvests. I consider this a crucial step in my “prepping” and my goal of providing healthy food for myself, my family, and my community. Jim K., Texas, USA, 27 Sept 2017 (ADC) – Committing one’s time and resources to designing and building an aquaponics system requires one has the confidence to begin the journey. Murray’s Aquaponics Design Course has in six weeks provided the system understanding that has given me the confidence to take action. Murray is an excellent teacher and his passion, humor, and practical approach make the course entertaining and easy to follow. The course is well worth the time invested! Xi Z., New South Wales, Australia, 27 Sept 2017 (ADC) – It is a wonderful course. It basic taught me every thing about Aquaponics from nil. I think I can run one without any big mistakes. 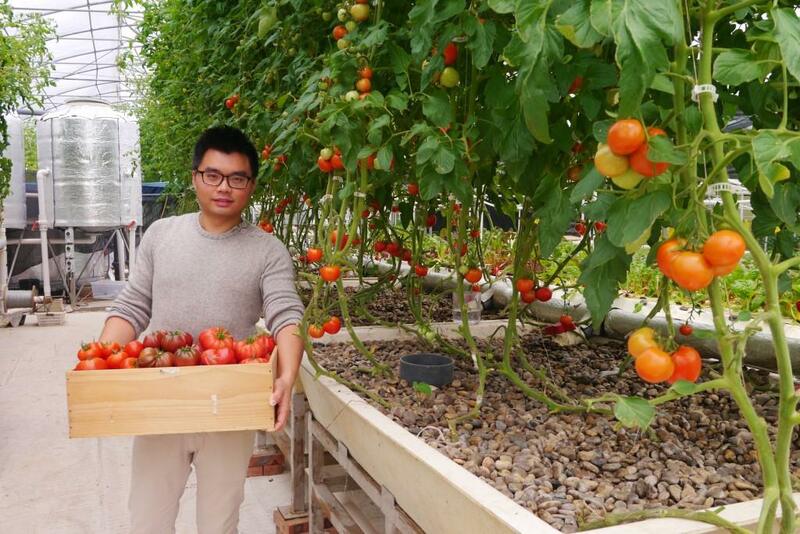 Patrick S., Shanghai, China, 27 Sept 2017 (ADC) – After researching online on the different aquaponic courses options, I had no doubt that this course would be the best choice and I was not wrong. Murray’s global experience in the field on all aspects is unrivalled. All aspects are covered, from the proper design and construction of aquaponic systems, the set-ups of pumps, batteries and mechanical maintenance, to all the other aspects from chemistry to agriculture and economics that are relevant to be successful in this industry. For people such as myself which live on a busy schedule, this online course allows to organize the study time whenever possible in between busy schedules and different countries’ time shifts. Lessons can be reviewed anytime needed. The course is taught in a way that people without an agricultural background such as myself, can easily understand the course and gain a vast amount of knowledge that enables one to kickstart its aquaponic venture with confidence. Definitely satisfied and would recommend this course to anyone, from the beginner to those who already have knowledge of aquaponics but want a systematic approach and in depth understanding of how it works. Jon C., New South Wales, Australia, 27 Sept 2017 (ADC) – I came across Murray Hallam and the Aquaponics Design Course by accident while searching of ways to improve the performance of my own small system (Youtube is only good to a point). Initially I experienced the fear of parting with cash for an unknown outcome. Once I started the course I didn’t think again about the cost. Excellent content: thorough, concise and delivered with generosity, passion, humour and commitment. Murray reminded me of a good humoured Bill Mollison and I believe that Murray’s legacy, through this course, will be as significant as Bill’s. 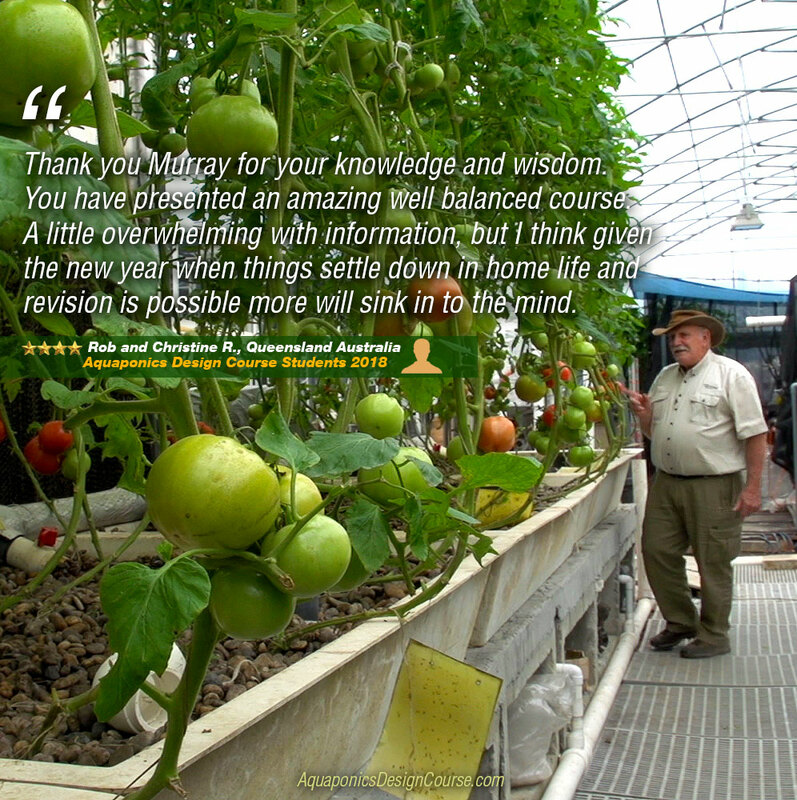 Syed M., Singapore, 27 Sept 2017 (ADC) – My extensive market research showed that Murray is the Aquaponics Guru of current time and I am so glad that I had the opportunity to learn from the Guru and interact with him virtually. 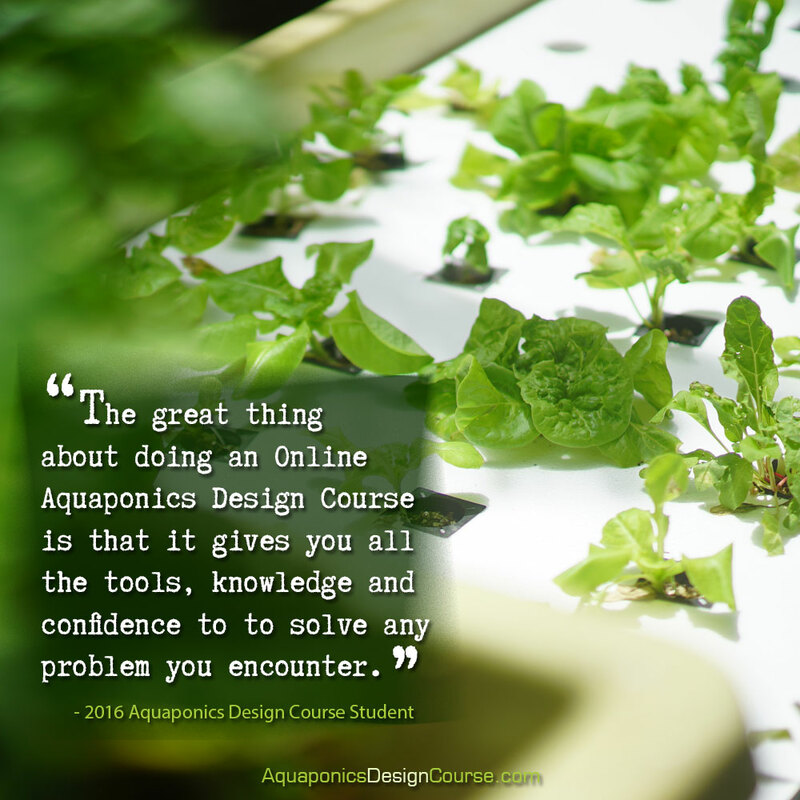 The course covers everything required to be an Aquaponics designer. His method of teaching is excellent, best teaching method I have ever experienced. Thank You Murray and the Team! Dhan K., Nepal, 27 Sept 2017 (ADC) – The course is very helpful if you are serious about aquaponics. Its worth the investment, if you want to start aquaponics system, and want to build it as your income source. It will reduce your time, and start your own system, immediately with confident. The course information will make aquaponics very easy to start. Alvin T., Philippines, 27 Sept 2017 (ADC) – I would like to thank Murray Hallam and his team for putting up this Aquaponics Design Coarse online for those people like me who cannot do the actual coarse, it gives me tremendous knowledge and techniques and practical applications on the field of Aquaponics. I would be very happy to meet and learn more from Murray Hallam personally sometime in the future. Congratulations and Best Wishes to all. Ebinbin A., Abuja, Nigeria, 27 Sept 2017 (ADC) – Great course, wonderful experience and a ‘must attend’ for anyone really serious in learning Aquaponics through a practical approach. This course was very informative and cleared all doubts on Aquaponics while providing sufficient knowledge innovate my own design ideas on Aquaponics design from start to finish. Mark C., Kansas, USA, 27 Sept 2017 (ADC) – By far the best online class I’ve ever taken, no regrets!! Very informative, eye opening and worth every penny. How good is that!! Ornela F., United Kingdom, 27 Sept 2017 (ADC) – Thank you so much for a such great course . Very well organised . English is not my mother language but I did understand everything. Good printed materials to keep. Big thank you. Boganatham S., India, 26 July 2017 (ADC) – I am very interested in aquaponics. I read so many videos. Your explaining is very good. David B., Maine, USA, 6 July 2017 (ADC) – I have been working with hydroponics and aquaponics for several years and this course answered so many of the questions I had with setting up and efficiently operating an aquaponics system. The course is loaded with new ideas and information that will make your aquaponics project successful and enjoyable. Murray is the best!!! If you want to do aquaponics the correct way, take this course. Absolutely awesome!! Marianne V., Taiwan (ROC), 3 July 2017 (ADC) – I am very happy that I signed up for the Aquaponics Design Course. It is very informative and inspiring. Murray’s experience and expertise is of great benefit to his students. I can’t wait to design my own Aquaponics system and start feeding myself and my family, and hopefully – very soon in the future – very happy customers. Lawrence B., California, USA, 3 July 2017 (ADC) – This is an excellent class. Very well thought out. It walks us through from the very start. Each step builds on the last making it straightforward and easy to progress. This is a wonderful start to aquaponics. 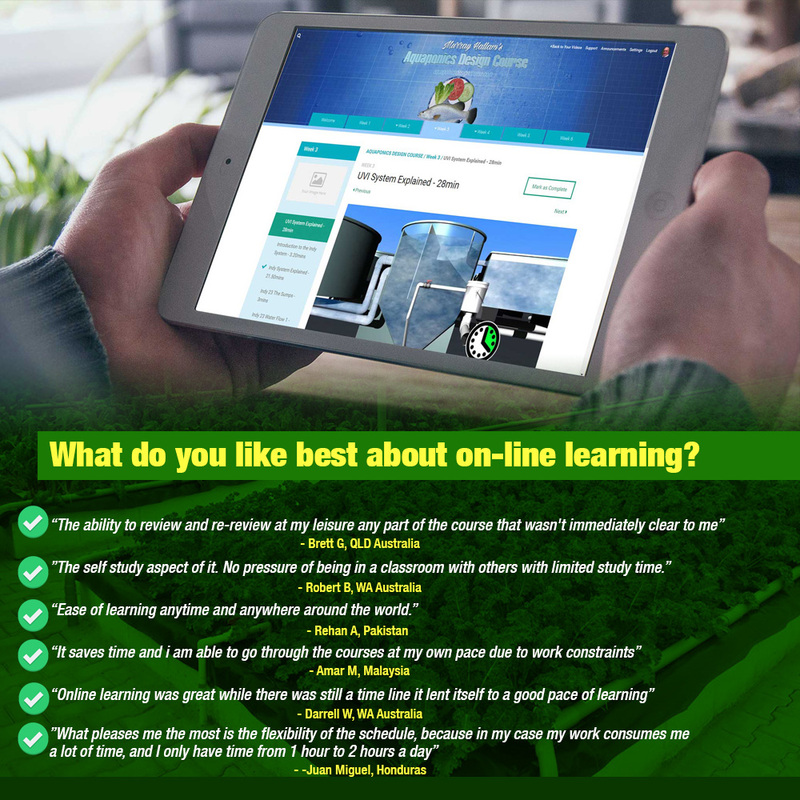 Dan R., Queensland, Australia, 1 July 2017 (ADC) – Murray’s online aquaponics design course is super informative, this course is worth the money. Whether you are just wanting to run a system for your own use or design, build and run commercial farms. Talking to people that are running small systems since I have done the course, it becomes obvious that you can stumble along and get some sort of result with limited information. Murray’s course provides much more complete information on the entire process from design to produce. Importantly for me, I now understand WHY and HOW this process works. Thanks for a great course. Cedric F., Mauritius, 23 June 2017 (ADC) – I have been across Aquaponics on the internet, but Murray’s approach has shown to be the best so far. In terms of knowledge, in passing this through online and of course, for his unmatched sense of humour. Definitely worth every dollar I spent into this course. 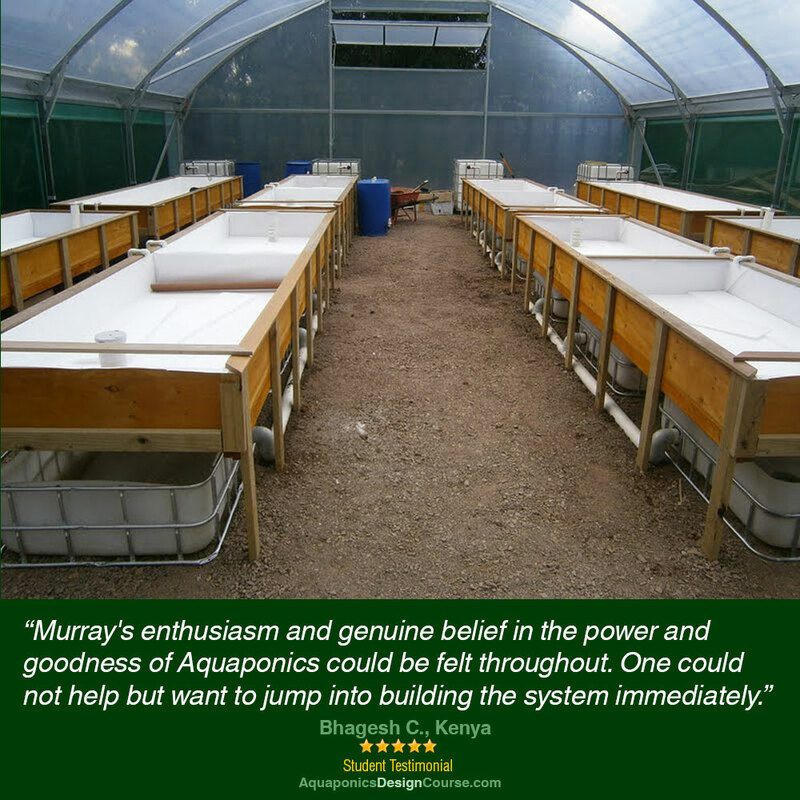 Ryan G., Kansas, USA, 21 June 2017 (ADC) – I thoroughly enjoyed Murrays Aquaponics course and stockpiled a valuable amount of knowledge during the 6 week online course! The videos made it easy to go at your own pace and not feel pressure to keep up! The website interface is very user friendly and allows you to mark the videos as you’ve watched them, I found this very helpful. Murray has an excellent method of delivering the information, in a way that is understandable for all aquaponic experience levels! I highly recommend this course to anyone interested in moving water, plants, or fish! – Ryan Guinn, USA. Mario W., Sarawak, Malaysia, 20 June 2017 (ADC) – I highly valued the 6 week’s Murray Hallam’s Design Course. We students felt that Mr Murray is a great facilitator and good presenter in the aquaponic course. The course gave me great inspiration of wanting to become a commercial farmer by investing in a large commercial aquaponic system in the near future. Most important, we are confident of undertaking a aquaponic unit project after the course. Thank you , sir. Yasser B., Saudi Arabia, 20 June 2017 (ADC) – Every now and then I like to learn and master something new, and this was the perfect place to come and master Aquaponics from the master himself. Judy D., Bahrain & Kenya, 19 June 2017 (ADC) – I thoroughly enjoyed the course and eagerly awaited Sundays when the next subject went live! As someone already said – it was like waiting for Christmas Day! John C., Namibia, 15 June 2017 (ADC) – The Aquaponics Design Course is a great investment into your self, your health and your pocket! A definite MUST DO!! Deborah C., Utah, USA, 15 June 2017 (ADC) – I was nervous about choosing from the many courses out there, I wanted to make sure that whatever course I choose gave me all the information I needed to feel comfortable and confident in doing a small farm on my own. I have to say, Murray’s Aquaponics Design Course exceeded my expectations. There was more information than I could have imagined and it was easy to follow. Not only do I feel confident, but Murray and his team are there every step of the way and are very responsive. This course gives you all the information to run ANY size system, all the do’s and dont’s, back-up systems and all the ratios to figure out how many fish, how many plants, what size tanks, etc. And what I found so valuable is he makes you think about every aspect of your business like marketing, the land you choose, your water and power sources, the type of fish and plants you choose, how to heat/cool your green house and even other farms in operation, which were so inspirational! Some of the business desicions may sound obvious but he opens your eyes to a lot of options and variations. This course is not only thoroughly informative but I love that you become part of an EDUCATED community and that share ideas, ask question and continually learn more and more. Tony H., Queensland, Australia, 13 June 2017 (ADC) – This is an excellent course for a beginner right through to someone with a fair bit of Aquaponics experience. It is essential for anyone wanting to run a successful backyard operation and/or a commercial setup. Very comprehensive and easy to follow. 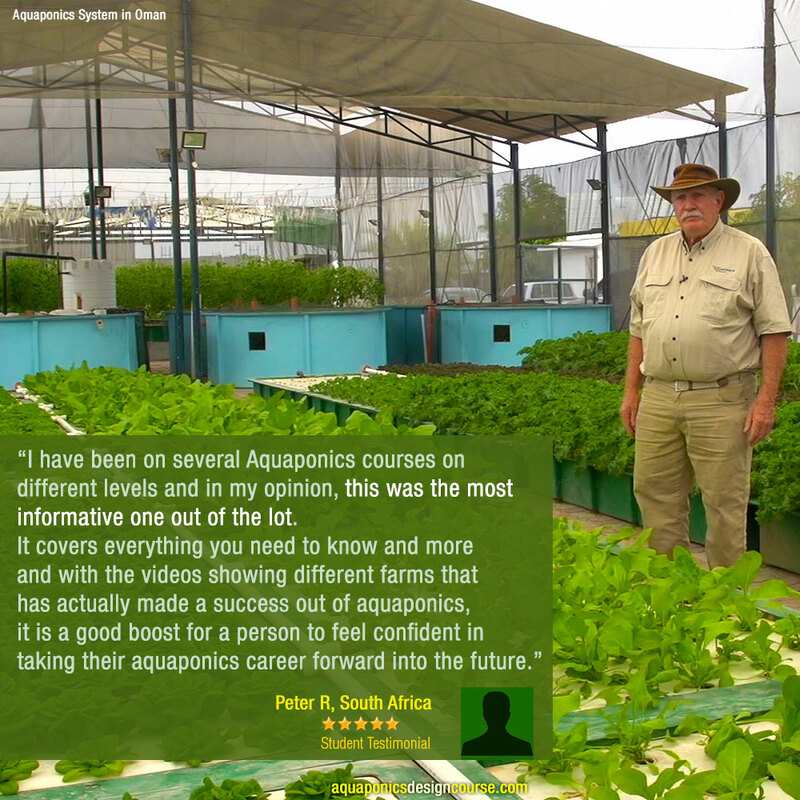 Murray, you truly are the “Godfather of Aquaponics” in Australia. Olimpo M., New South Wales, Australia, 12 June 2017 (ADC) – I want say thank-you to Mr Murray to share his knowledge to me, I enjoyed every section in this course well-done Thanks again Olimpo. Brent O., Hong Kong, 11 June 2017 (ADC) – A commercial aquaponics farmer I’d been in contact with recommended Murray Hallam’s online course. Despite high expectations, it didn’t disappoint. It was excellent. I look forward to next taking Murray’s masters course. Abraham D., Qatar, 11 June 2017 (ADC) – Thank you very much Murray Hallam’s ADC Team. Donald C., New York, USA, 11 June 2017 (ADC) – I found the course to be worth every penny I payed. The information was organized and in order. The plans and material listings were great, the idea that you must DIY some of this based on country is not lost on any one and helpful information and alternative materials information come free and willing from both instructor and student. I feel that I can in time set up a new secure and healthy way of living. Haydn R., Western Australia, 10 June 2017 (ADC) – I found the course to be very useful in answering some major questions. I would highly recommend to experiment with a small system before starting the course and during the course, so the new information can be applied and understood clearly. 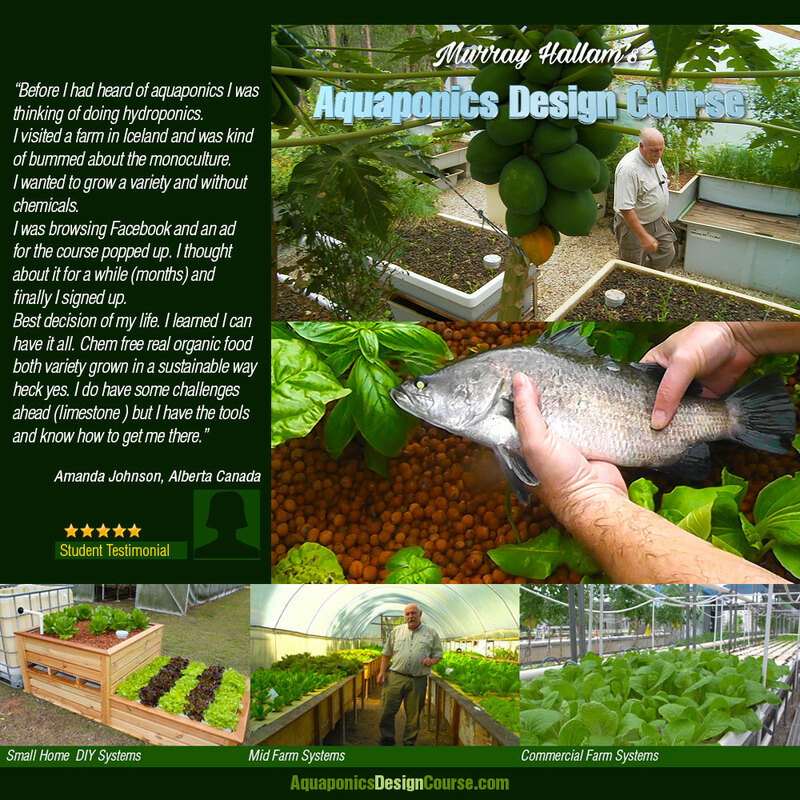 Joan H., Alberta, Canada, 9 June 2017 (ADC) – Murray Hallam’s Aquaponic Design Certification Course came into my life at a most opportune time. I was not looking for this opportunity, it found me and I was immediately intrigued. My passion for gardening button was pressed and I enrolled in the course. Aquaponics was one big mystery to me 3 months ago. Murray’s common sense approach and his passion for food purity, food security and food sovereignty make this course an easy “Win, Win” situation for me! Well done Murray and team! Gregory E., Texas, USA, 9 June 2017 (ADC) – I took the Aquaponics Design Course online with Murray Hallam from April to June 2017. The class started off nice and slow to introduce the students to the concept of aquaponics. The course gradually built up as we covered lessons about seed acclimatization, the nitrogen cycle, the importance of oxygen, pH, and minerals like iron, potassium, etc. From a knowledge standpoint, the class is very well-rounded and touches every topic you need to successfully pursue a home or commercial system. Also, the team was very supportive of the students. After the first week of the course, a student that had problems understanding Murray’s English requested that closed-captions be added to the videos. Sure enough, the captions were added to each video within a few days. Not only that, but they also respond to student questions posted on the website after each lesson. Also, Murray often gives most measurements in metric and imperial, which really helps US citizens put dimensions in perspective.